VMware Horizon® Cloud Service™ is a family of cloud services that delivers virtual desktops and applications to end users on any supported device. 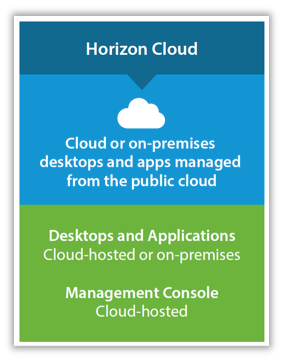 Horizon Cloud is available as a VMware-hosted infrastructure, or as an on-premises infrastructure. In both modes, the Horizon Cloud application manages the infrastructure. This tutorial helps you evaluate the VMware Horizon Cloud Service with Hosted Infrastructure by introducing you to the benefits, features, and components. It includes exercises to install and set up a service evaluation environment. Additional exercises help you explore the core capabilities and how to use them, as well as the ability to integrate with products such as VMware Identity Manager™ and VMware User Environment Manager™. Note: This tutorial describes a basic deployment and some key features. 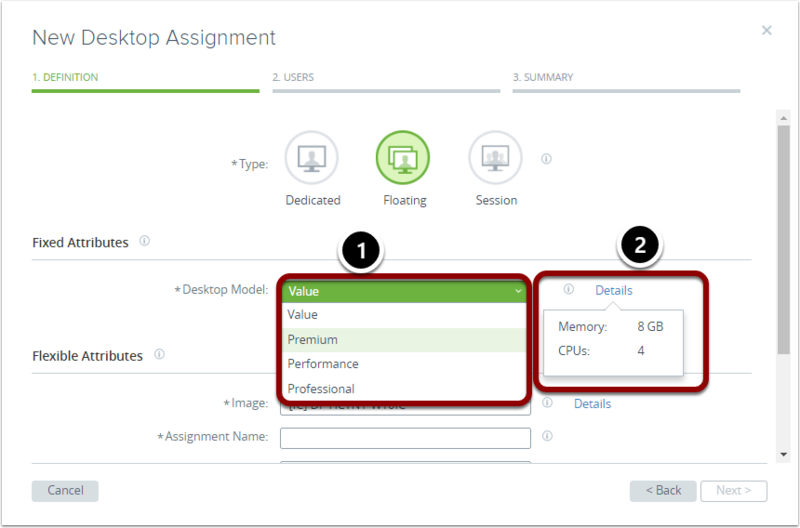 To explore features beyond the scope of this tutorial, see the VMware Horizon Cloud Service Documentation. This tutorial is for IT decision-makers, architects, administrators, and others who want to familiarize themselves with, or are in the process of, a Horizon Cloud with Hosted Infrastructure deployment. You should be familiar with basic VMware components, virtual machines, virtual desktop infrastructure (VDI) concepts, and Remote Desktop Session Host (RDSH) servers. You should also be familiar with cloud computing, site-to-site (S2S) VPNs, and Multi-Protocol Label Switching (MPLS) networks. Using the navigation bar on the left, you can access the following exercises to set up and configure a Horizon Cloud environment and explore some of the key features. It is recommended that you complete these sections in order, as they build upon one another. Section A takes you step-by-step through setting up a Horizon Cloud tenant and configuring a Horizon Cloud Hosted Infrastructure environment. Section B explores the Administration Console and how to customize your environment. Section C shows you how to create an image. 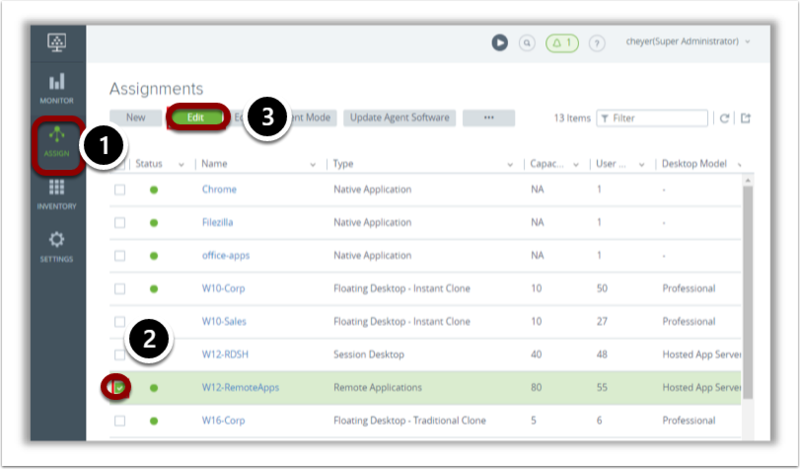 The subsequent sections show you how to assign access to desktops, native applications, and remote applications. These sections are independent of each other, so you can start at the beginning of any section and proceed in any order. 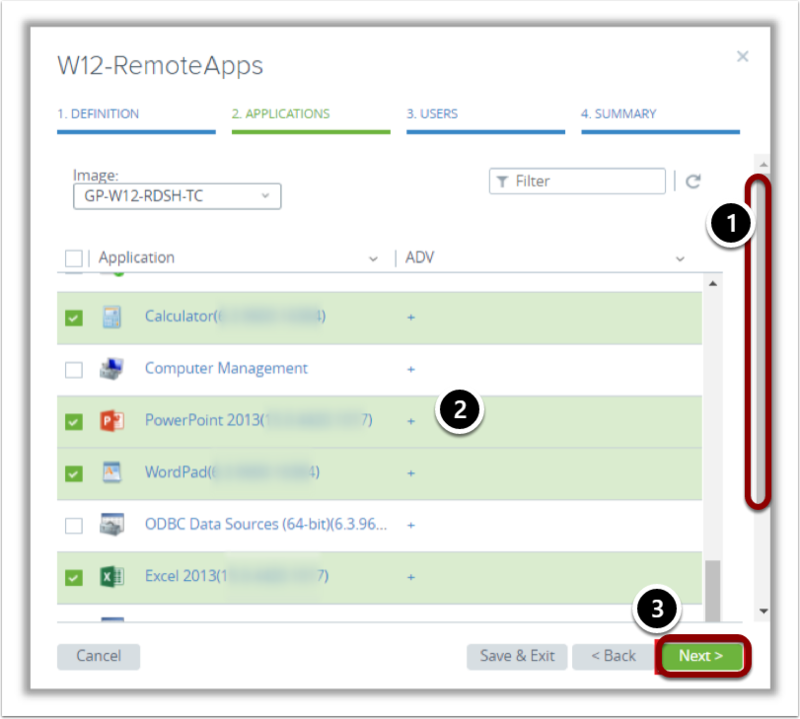 The final sections demonstrate integrating Horizon Cloud with other VMware products to provide an enhanced and optimized end-user experience. The Horizon Cloud service delivers virtual desktops and applications using a purpose-built cloud platform that is scalable across multiple deployment options, including on-premises infrastructure or fully managed infrastructure from VMware. The service supports a cloud-scale architecture to deliver virtualized Windows desktops and applications to multiple devices, simplifying setup and scalability. Horizon Cloud with Hosted Infrastructure simplifies delivering Windows desktops and applications as a cloud service while maintaining enterprise requirements for security and control. End users benefit from a complete workspace that they can access from a variety of device types from almost any location. Horizon Cloud with Hosted Infrastructure also offers an on-demand, flexible desktop and application delivery platform that can grow or shrink based on the needs and demands of your business. The need to reevaluate desktop strategies is driving many companies to consider VDI. VDI solves many traditional challenges of physical desktops. With VDI, desktops are centralized onto virtual machines that run in corporate data centers. Cloud-hosted virtual desktops take that one step further. They make day-to-day tasks, such as deploying new desktops and applications and supporting distributed workers, easier and less labor-intensive. Users access their virtual desktops via remoting technology, making it possible for IT to finely control the movement of data into and out of the data center. If a laptop or mobile device is stolen or lost, your enterprise is at less risk because data is not stored on the local device. You can purchase Horizon Cloud hosted infrastructure directly from VMware or bring your own certified hyper-converged infrastructure appliances to host your virtual desktops and applications. For more information, see How to Buy. You can streamline the effort of infrastructure management and application delivery by transferring to the cloud with managed infrastructure from VMware. Horizon Cloud with Hosted Infrastructure provides you with optimum security and support, with an infrastructure that can scale faster than traditional on-premises environments. You can choose from a variety of desktop configurations, application delivery methods, and data center locations. You can reduce costs and forecast them with simple and predictable per-user pricing. For the most current list of benefits, see the Benefits section of VMware Horizon Cloud Hosted. Horizon Cloud Administration Console: The web-based portal used by IT administrators to provision and manage Horizon Cloud desktops and applications, resource entitlements, and images. The Horizon Cloud Management Console provides full life-cycle management of desktops, VMware App Volumes™, and RDSH through a single, easy-to-use web-based console. Organizations can securely provision and manage desktop models and entitlements, as well as native and remote applications, through the centralized Horizon Cloud Management Console. The console also provides usage and activity reports for various user, administrative, and capacity-management activities. Horizon Cloud user portal: A web-based portal offering users clientless access to Horizon Cloud desktops and applications using HTML5. Horizon Cloud tenant appliance: A hardened Linux appliance that provides desktop and application brokering, provisioning, and entitlement services. It hosts the end-user and administrative portals. Image or image template: A desktop or RDSH server image that can be used in a Horizon Cloud tenant to create desktop or application assignments. It is used as the base image from which virtual machines (VMs) are cloned. 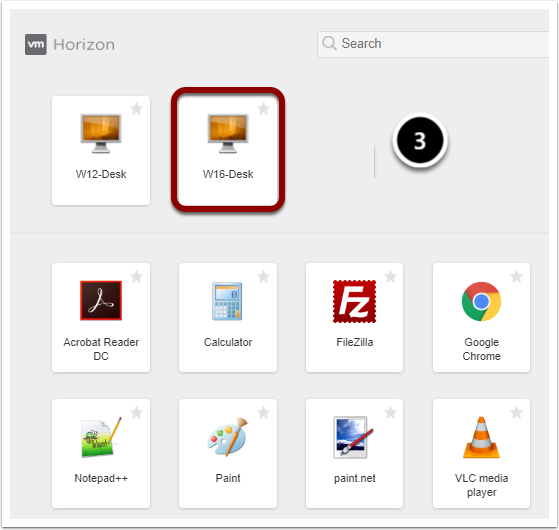 Horizon Cloud–hosted virtual desktop: A virtualized and optimized desktop that is hosted in Horizon Cloud. A virtual desktop supports a single connection, delivering a fully functional desktop to the end user. 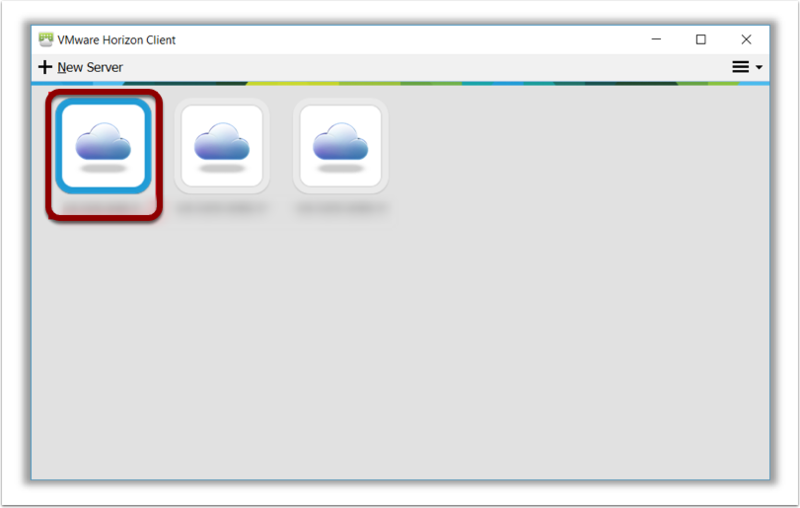 Horizon Cloud agents are installed on the virtual desktop to support a connection from the Horizon Client. Horizon Cloud–hosted RDSH: A server-based model for delivering applications and shared full desktops in Horizon Cloud using Microsoft Remote Desktop Services and VMware Horizon technology. Compared to a single connection for each virtual desktop, RDSH servers can support multiple desktop and application sessions from different users. Horizon Cloud agents are installed on the RDSH servers to support connections from the Horizon Client. Edge Gateway: A gateway that provides network edge security and gateway services to isolate security zones and virtualized networks along with NAT, DHCP, VPN, and a load balancer. 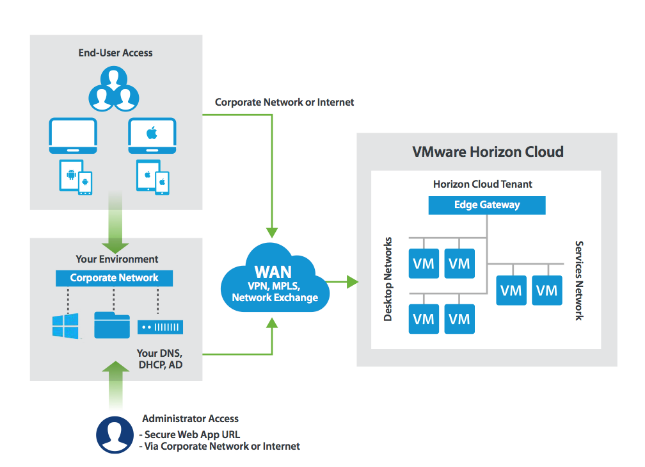 VMware Unified Access Gateway™: A hardened Linux appliance that allows for secure remote access into the Horizon Cloud environment and is part of the Security Zone (for external Horizon Cloud access) and the Services Zone (for internal Horizon Cloud access). Note: For more information about features, components, and capabilities, see Service Description: VMware Horizon Cloud Service with Hosted Infrastructure. VMware User Environment Manager™: Provides personalization and dynamic policy configuration across virtual, physical, and cloud-based Windows desktop environments for managing a user’s persona across devices and locations. For more information, see User Environment Manager with Horizon Cloud. VMware Identity Manager™: Provides a central location from which to manage access policies and user provisioning with enterprise-class directory integration, identity federation, and user analytics. 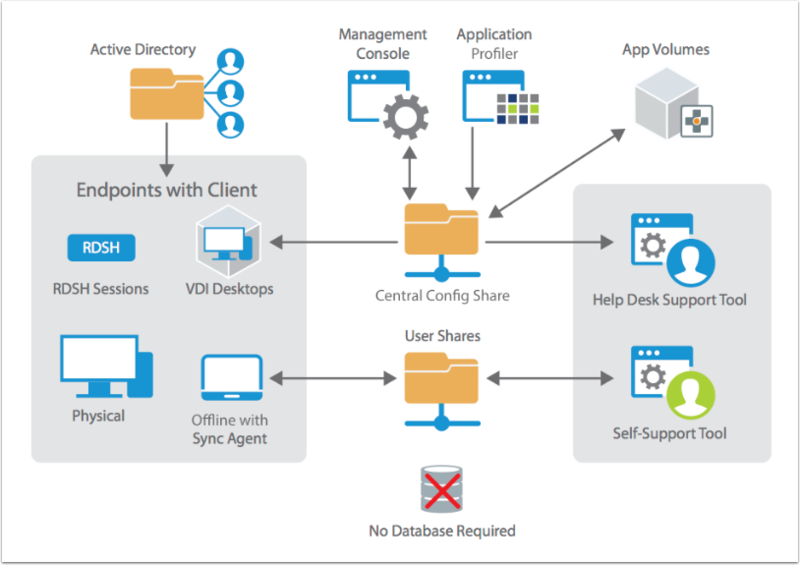 VMware Identity Manager provides end users with one-touch access to applications from any device, from any location. For more information, see VMware Identity Manager. After gathering the data that you need to configure Horizon Cloud, proceed to the next exercise and log in. The setup and administration of your tenant takes place in the Horizon Cloud Administration Console, which you access using a URL supplied by the Horizon Cloud service provider. Note: These exercises use self-signed certificates, unlike for a production environment in which live certificates are exchanged during deployment. The first time you log in to the tenant, you must provide a one-time username and password. After Horizon Cloud is added to your Active Directory domain, these credentials no longer allow access. In your browser, navigate to the Horizon Cloud tenant. On the Horizon Cloud login page, enter the credentials provided. After logging in, proceed to the next exercise to register Active Directory in the Horizon Cloud tenant. After the Horizon Cloud service provider provisions your Horizon Cloud environment, also known as a tenant, you must register your Active Directory with Horizon Cloud before you can allocate services or assign specific roles and permissions. The Horizon Cloud Administration Console defaults to the Getting Started page on the first login. This page provides a high-level overview of the initial configuration process that you must complete. In the navigation bar on the left, select Settings. In the Settings menu, select Active Directory. On the Active Directory page, click Register. After joining Active directory to Horizon Cloud, you must use a domain account that is a member of the domain group added to the Super Administrator role during the initial configuration. The one-time password that was supplied by your provider no longer works. Proceed to the next exercise to define this administrator account. In Horizon Cloud, the domain user or group with full administrative control within the tenant is defined as the Super Administrator. Click the Search icon in the upper right. Enter your username, and click Go. 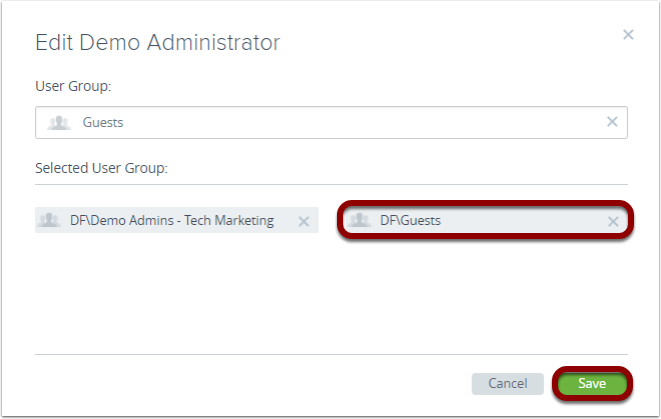 Verify that DF/Tenant Admins appears under Selected User Group. After registering the Active Directory, additional services and functionality are available. Configuring the administrative account enables you to access these resources. You are ready to proceed to Section B to tour the Horizon Administration Console and complete the configuration of your tenant. You can manage the Horizon Cloud tenant using the Horizon Cloud Administration Console. In the navigation bar in the lower left, click Settings. In the Settings menu, click General Settings. This is where you can view and modify the general configuration. In the navigation bar, click Settings. In the Settings menu, click Active Directory. Here, you add domain bind and domain join data, which is required before you can do anything else. In the Settings menu, click Roles & Permissions, where you can create and assign roles to control who has access to the console. Super Administrator: A mandatory role that includes the ability to view all tenant options and apply configuration changes. A minimum of one Active Directory group must be assigned to this role. In these exercises, the Tenant Admins group is assigned to this role. Demo Administrator: An optional role that includes the ability to view all options within the console but cannot change the configuration. In the Settings menu, click Infrastructure, where you can create and manage file shares that are used to import data from your environment into Horizon Cloud. Infrastructure includes file shares used to import data into Horizon Cloud from your environment. You can add, import, and modify these file shares. In most cases, files placed in a file share are uploaded to the tenant. You can also manually import files. 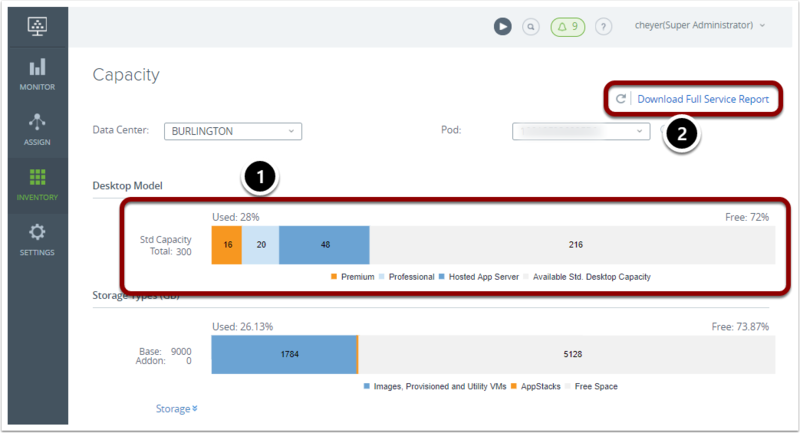 Application/Images: Stores AppStacks created by App Volumes. Agents: Houses agent software updates. After the location has been defined, the agent is available on the Assignments page. Note: When creating an application or image file share, the name can be anything you choose. You must house file shares on the Utility VM, which performs functions within the tenant and helps avoid latency issues. In the Settings menu, click Storage Management, where you can view and manage the AppStacks in your environment when using App Volumes technology in your tenant. For more information about how App Volumes technology can enhance administrative capabilities within the Horizon Cloud environment, see E: Assigning Access to a Remote and Native Application, on the navigation bar to the left. In the Settings menu, click Getting Started, the default view when you first log in to Horizon Cloud, which you can reset using the Show at Startup slider at the bottom. In the Settings menu, click Utility VMs, where you can view and manage utility VMs. The utility VM is a discovered VM that does not have a supported operating system for desktop use. The utility VMs provide infrastructure services within the environment, such as DNS or DHCP, and are required for housing AppStacks. 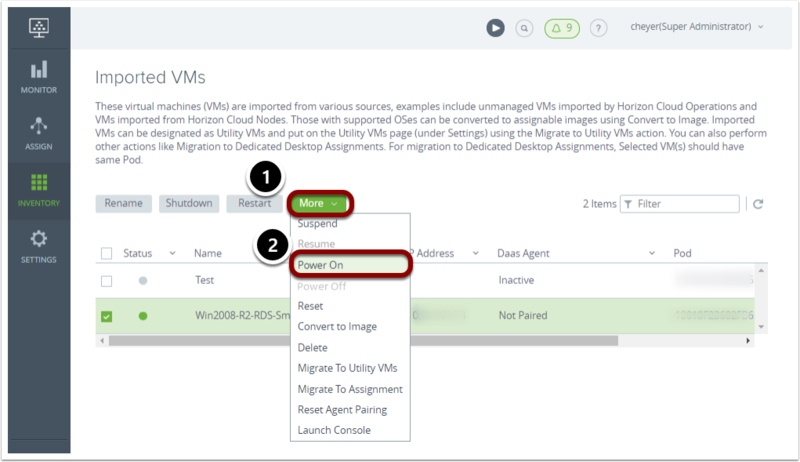 You can use the Utility VMs settings to perform management tasks and implement User Environment Manager. The first utility server is free. You can add subsequent utility servers for an additional cost. Note: The Horizon Cloud environment does not require a utility VM, but it is recommended for services such as Active Directory, DNS, and DHCP to avoid latency issues. 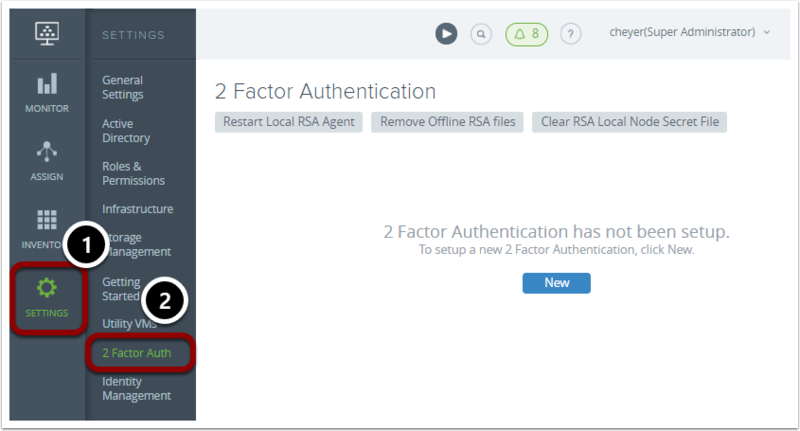 In the Settings menu, click 2 Factor Auth, where you can configure two-factor authentication for your end users using either RSA SecureID or Radius Authentication. In the navigation bar, select Settings. In the Settings menu, select Identity Management, where you can oversee all of your Identity Manager providers, and sort them by URL, Timeout Setting for Single Sign On Token, Data Center, Tenant Address, and Status. You can click Edit to add a new URL or modify an existing one. For more information, see VMware Horizon Cloud with Hosted Infrastructure Administration and VMware Horizon Cloud with Hosted Infrastructure 17.1 Documentation Center. After this brief tour of the settings options in a Horizon Cloud environment, proceed to the next section to use some of these options to set up your environment. You can modify the contact information through the General Settings option in the Horizon Cloud Administration Console. 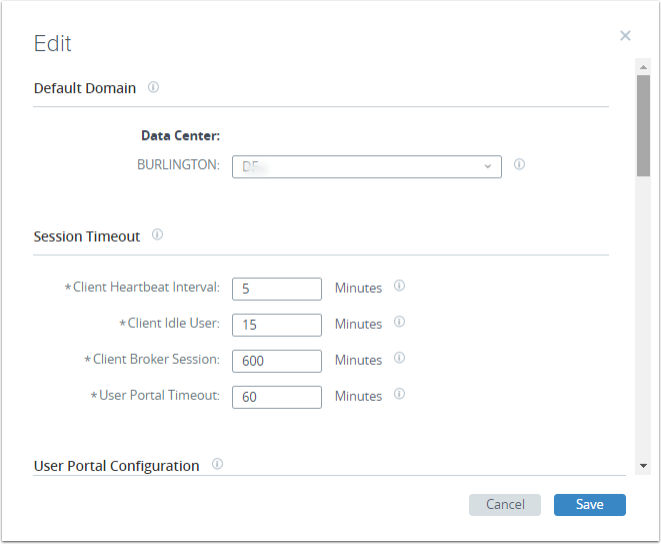 In the Horizon Cloud Administration Console, select Settings. On the General Settings page, click Edit. View the information that is displayed when other administrators log in to the Administrative Console. Scroll to the Contact Info section, and enter the name, phone, and email information. Scroll to the bottom of the General Settings page to the Contact Info section. Verify that the contact information is correct. After using General Settings to modify the contact information, proceed to the next exercise to use the Roles & Permissions settings to add a user or group to a role. You can control who has access to the console and assign or modify membership to roles. Horizon Cloud provides two built-in roles. Super Administrator: This mandatory role can view all options in the tenant and apply configuration changes. At least one Active Directory group must be assigned to this role. In this exercise, the Tenant Admins group is assigned to this role. Demo Administrator: An optional role that can view all console options, but cannot make configuration changes. In the Settings menu, click Roles & Permissions. Under Roles, select Demo Administrator. To add a user or group, click Edit. In the User Group field in the upper left, search your Active Directory for a user or group to add. In this example, the Guests group is selected. In the Edit page, verify that your selection is displayed under Selected User Group. 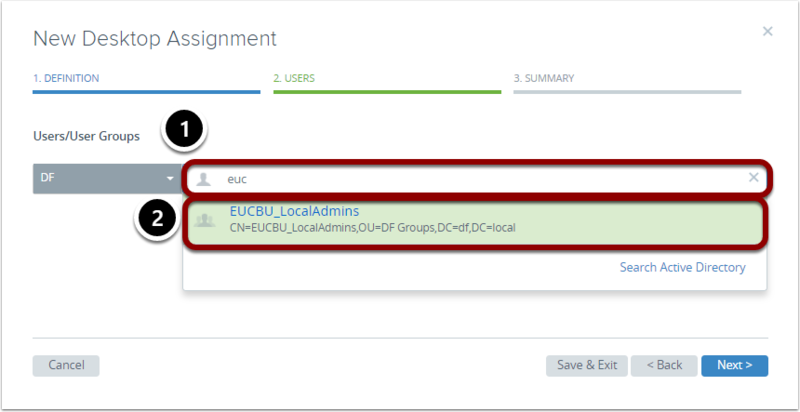 After using the Roles & Permissions setting to add a user group, proceed to the next exercise to use the Locations settings to define an agent. Agents: Houses agent software updates. After you define the location, the agent is available on the Assignments page. When you define a file share as an agent, you must name the folder agentFiles. (Unlike Agent shares, you can give Applications/Images shares any name.) You must house the file share on the utility VM, which performs functions within the tenant and helps avoid latency issues. In the Settings menu, click Infrastructure. On the Infrastructure page, click New. Name: Enter the name of the file share. Domain: Select the domain of the file share from the drop-down list. Username: Enter the username of the file share administrator. Password: Enter the administrator password for the file share. Source Path: Enter the network path to the file share. Verify that the Agents share is now listed with a status of green. After using the Locations options to define an agent, proceed to the next exercise to change the default view upon start up. The Getting Started page is the default view when you log in to Horizon Cloud for the first time. You can change the default view to the Dashboard page at any time. In the Horizon Cloud Administration Console, select Settings . In the navigation bar, select Getting Started. Scroll to the end of the Getting Started window. In the Preferences box at the bottom, use the slider to indicate whether you want the Getting Started page to appear at startup. Yes: The Getting Started page is displayed upon login. No: The Dashboard page is displayed upon login. In the confirmation page, click Yes to confirm your selection. For more information, see VMware Horizon Cloud with Hosted Infrastructure Administration. After using Getting Started settings to set the default view upon startup, you have completed the exploration of the settings available to you in a Horizon Cloud environment. Proceed to the next section to create an image. 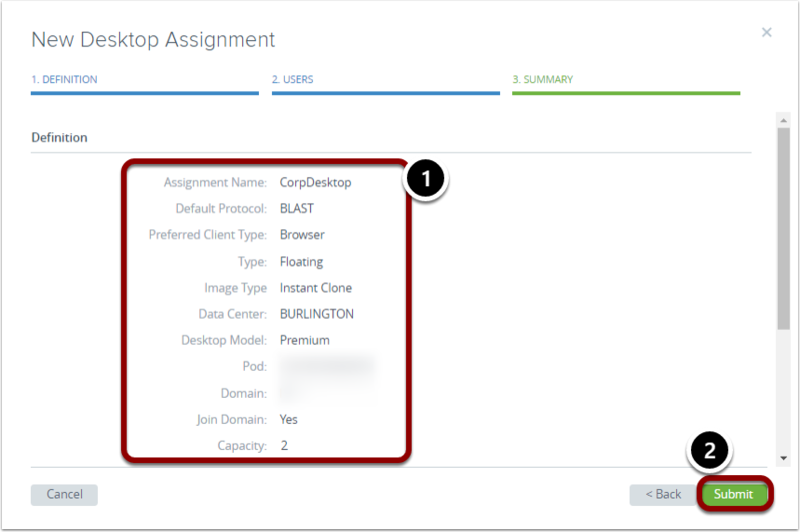 After you complete the initial configuration and exploration of your Horizon Cloud environment, you are ready to create a desktop image through the following exercises. You can use the image to assign your desktops, also referred to as publishing a desktop. For this exercise, contact your VMware service representative and request a VMware template. For more information, see Getting Started Horizon Cloud with Hosted Infrastructure. After you receive a VMware template and your provider uploads it to your tenant, proceed to the next exercise to create your image. An image is a pattern that you use to create assignments. Images are created from a template VM that is configured to meet the needs of a particular user type. 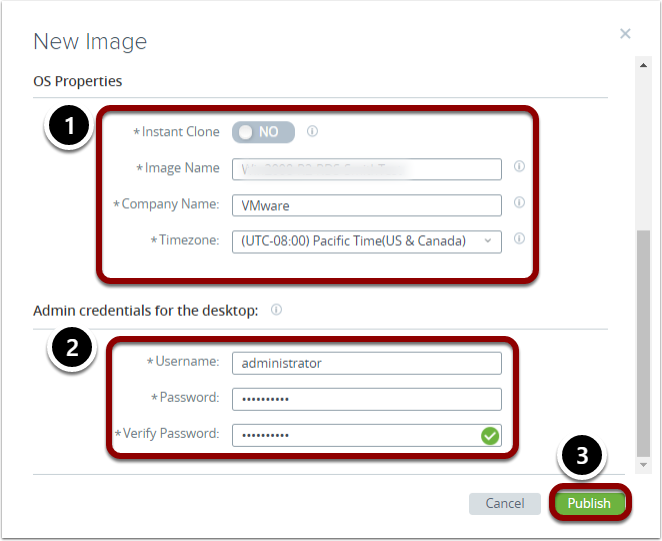 You can use a pre-packaged image from VMware, create an image from a VMware template, or create an image from your own template. When creating an image, you can choose between a traditional clone and an instant clone. With a traditional clone, a full copy of the image is used for each desktop deployed. With an instant clone, you gain the benefits of VMware JMP technology, which allows for faster provisioning, using less space. In this exercise, an instant clone is used. 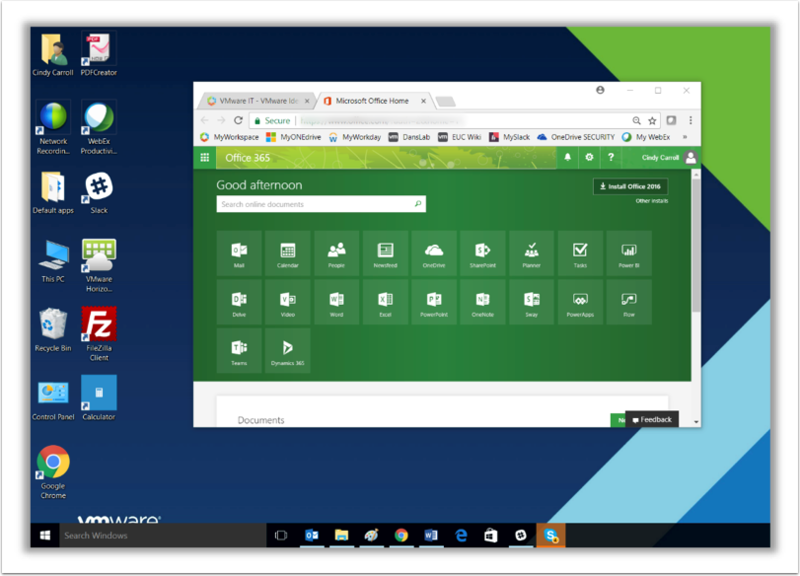 For more information, see VMware Instant Clone Technology for Just-In-Time Desktop Delivery in Horizon 7 Enterprise Edition. In the Horizon Cloud Administration Console, select Inventory. On the Images page, click New. On the New Image page, navigate to the Convert Desktop to Image section. Enter the first few letters of a template name to trigger a display of all desktops that you can convert to an image. Note: The desktop inventory takes a few minutes to display. Make sure that the desktop you want to use is powered on. Instant Clone: Set to Yes. Image Name: Enter the name for the new image. Domain: Required for instant clones only. Select the domain from the drop-down menu. Timezone: Select your time zone from the drop-down menu. Note: Depending on the size of the file, the publishing process can take some time. On the Images page, verify that the status of the new desktop image is Published. After you complete the image creation process, proceed to the next section to assign a desktop to a user or group. Before you assign a desktop to a user or group, check the capacity allocation on the Dashboard page. The Dashboard provides information about your environment, including notifications, activities, and reports. Hover over the Capacity window, which changes the display. After checking the Desktop Capacity Allocation, proceed to the next exercise to assign the desktop and see how the numbers are affected. You can choose which type of desktop to assign to a user or group in the Assignments window. 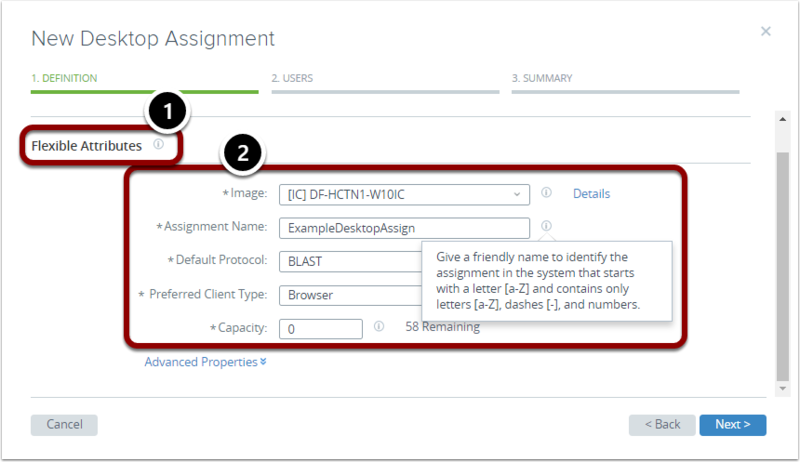 You can use the Assignments window to create, edit, and delete an assignment, and update the agent software for any existing assignments. 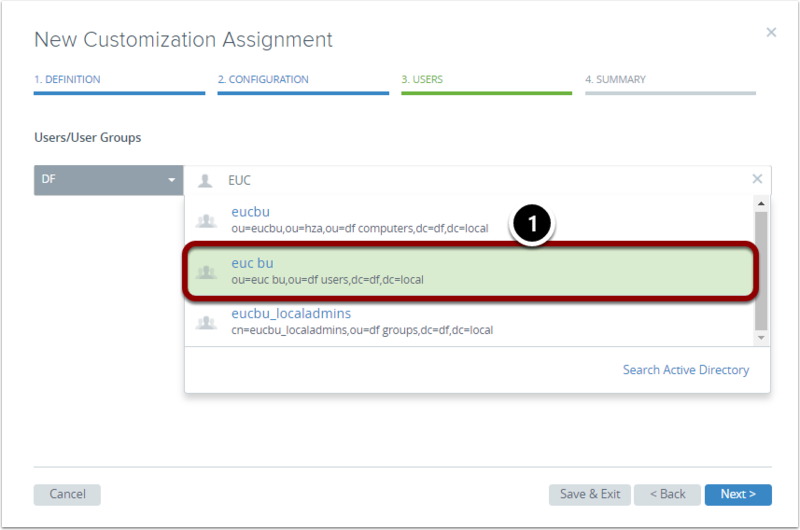 In the Horizon Cloud Administration Console, select Assign. In the New Assignment page under Desktops, click Select. Note: You would select Applications if you wanted to assign AppStacks or RDSH applications. For this example, a desktop is assigned. On the Assign Desktops page, select Floating to define the desktop type. Dedicated: Assigns the user to a specific, persistent VDI desktop every time the user logs in. 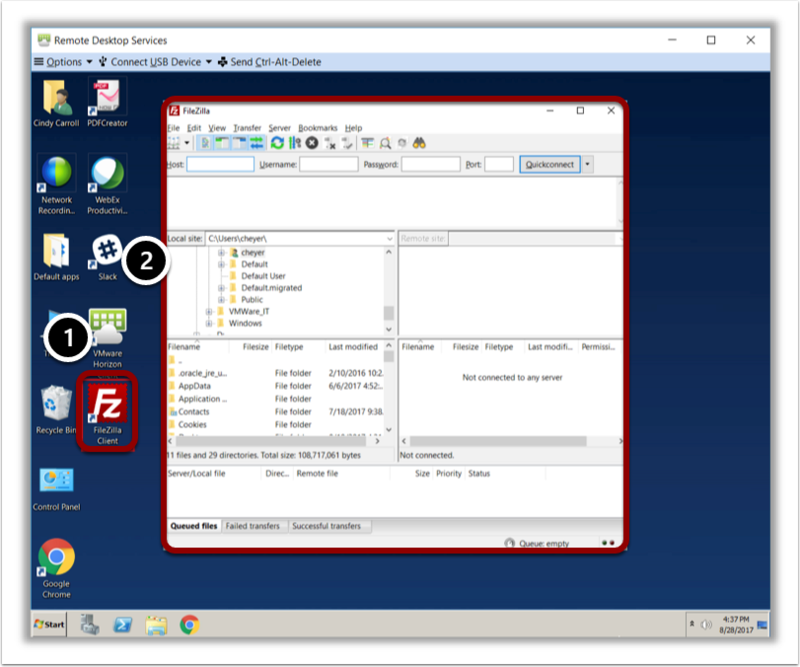 Floating: Assigns the user to any available non-persistent VDI desktop, which multiple users can use at different times and resets after each user session. This desktop type is required when using an instant clone. Session: Assigns the user to a personal, non-persistent RDSH published desktop shared across multiple users. In the Desktop Model menu, select Premium. Click Details to view the resource specifications of the model. In the above example, the desktop model has 8 GB of vRAM and four vCPUs. Note: In the Fixed Attributes section, you can choose from several types of desktop models with various compute, storage, and feature resources. The desktop model determines how the computers are provisioned. For more information, see the Service Description: VMware Horizon Cloud Service with Hosted Infrastructure. Image: Select the image created earlier from the drop-down menu. Assignment Name: Enter the assignment name. Default Protocol: Select either BLAST or PCoIP. This example uses Blast. Preferred Client Type: Select either Browser or Horizon Client. This example uses Browser. Capacity: Select the capacity up to the maximum remaining available. This example shows 58 remaining. At the bottom of the Flexible Attributes section, click Advanced Properties, an option to configure additional desktop assignment parameters. VM Names: Accept the default VM name that you created earlier. Run Once Script: Leave blank. This indicates the location of scripts that run after system preparation completes. Session Timeout Interval: Accept the default. This sets the amount of time users can have an idle session before the system forces a log off, which would result in the loss of unsaved data. Enable Windows Hot-Plug: Accept the default. If enabled, this allows users to add or remove a device such as a NIC or disk, which can interfere with connectivity if done improperly. Verify that you are in the Users tab. In the Active Directory Search field, enter the user name to assign the desktop to. As you enter, the list appears. From the list, select the user groups to assign the desktop. You can select multiple users and groups. In this example, only one user group is selected. In Selected Users/User Groups, confirm that the correct user(s) or group(s) are listed. In the Summary tab, review the settings you entered. Note: You must wait until the creation process is complete before you proceed. This process can take several minutes. You might need to refresh your browser periodically to expedite the process. On the Assignments page, confirm that the desktop was created. Verify that the desktop assignment has a status of green. After you finish assigning a desktop to the user, proceed to the next exercise to launch the desktop from a browser. You can access the desktop via the Horizon Client, which includes versions for all major operating systems, as well as a browser-based HTML 5 client. For this exercise, you can verify the desktop assignment by launching from a browser. Navigate to your tenant URL. From the desktops assigned to you, select a desktop to launch. Wait for Windows to build the profile. Note: It can take several minutes for a fully functional desktop to display. Return to the Horizon Cloud Administration Console, and in the navigation bar, select Monitor. Hover over the Dashboard window to change the display. In the lower right, click More. In the Capacity window, verify that the connection with the desktop is active, and that the host allocation has increased. In the upper right, click Download Full Service Report. Review the desktop allocation details in the Full Service Report. After you verify that the desktop is assigned and connected properly, proceed to the next exercise to review the recent activity. 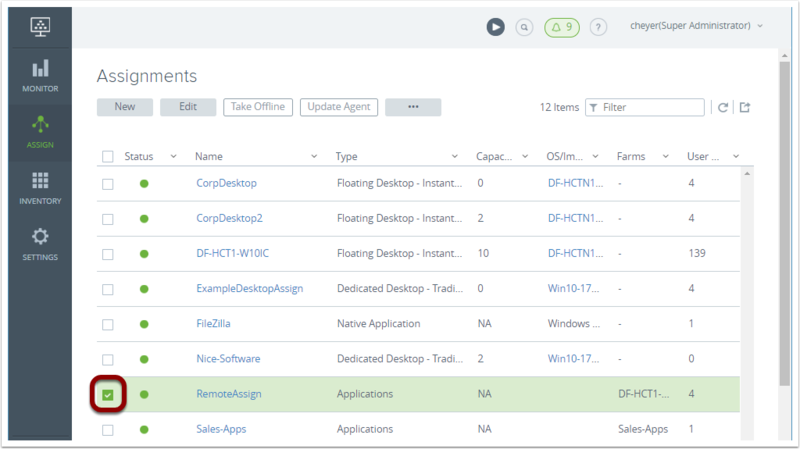 You can use the Horizon Cloud Administration Console to monitor recent activities, including the desktop assignment you just completed. The Activity page displays both administrative and user activity for time spans ranging from 24 hours to 30 days. In the Monitor menu, click Activity. On the Activity page, review the desktop assignment activity you just completed. After you review the most recent activity, proceed to the next exercise to review reports. The Reports page displays resource mappings, including user and desktop mappings. In the Monitor menu, click Reports. On the Reports page, review the desktop assignment you completed in the previous exercise. Select the Export Data icon to export the report as a zipped CSV file. After you review the reports, proceed to the next exercise to review notifications. 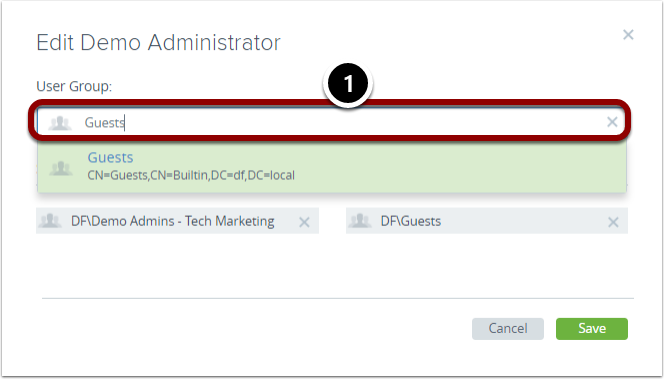 You can use the Horizon Cloud Administration Console to review system notifications. As with reports, you can view notifications data ranging from 24 hours to 30 days. In the Monitor menu, click Notifications. In the Notifications window, select a time span from the Show menu. In the upper right, click the bell-shaped notification icon to see notifications in an abbreviated list format. You now have a fully functional desktop ready for your users to access. The next section shows you how additional VMware products, such as App Volumes, can enhance your experience in the Horizon Cloud environment. 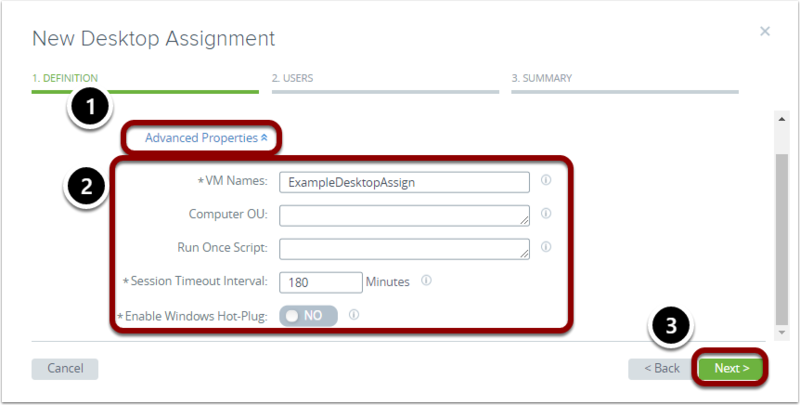 In the following exercises, you use AppStacks, an App Volumes feature, to assign applications to Horizon Cloud virtual desktops. A Chrome browser is recommended for the best experience. 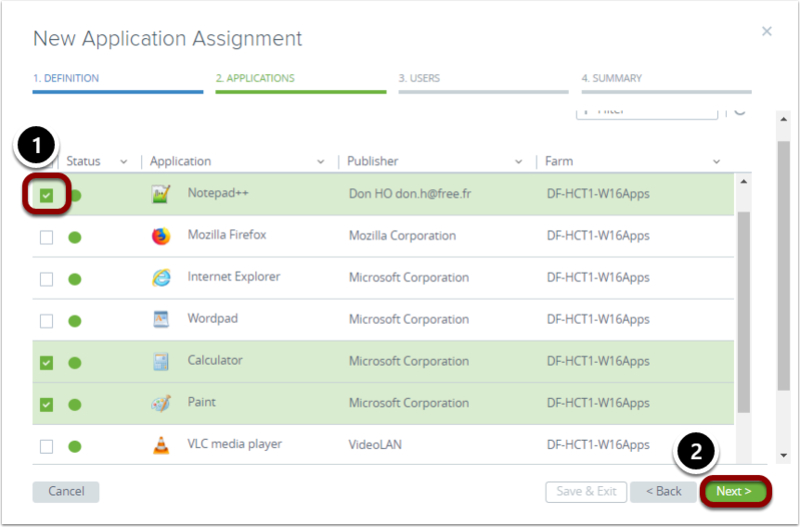 Package applications with AppCapture: Package the application using the AppCapture utility, which allows Horizon Cloud to attach the package to the virtual machine upon login. You use the AppCapture utility to get the before state of the virtual machine. After the applications and any dependencies are installed, AppCapture takes an after state of the virtual machine. The after state includes the files, folders, and registry entries that were changed in an application package. When the application capture is complete, the application package is moved to a staging file share. The virtual machine is reset to a clean snapshot. You use the AppCapture utility to test the application. When the application is validated, it is converted into an application package in VMDK format and moved into the production file share, where it is imported into Horizon Cloud. Configure and synchronize the AppStacks file share: Import the AppStacks into Horizon Cloud. For more information, see the Adding AppStack File Share video. 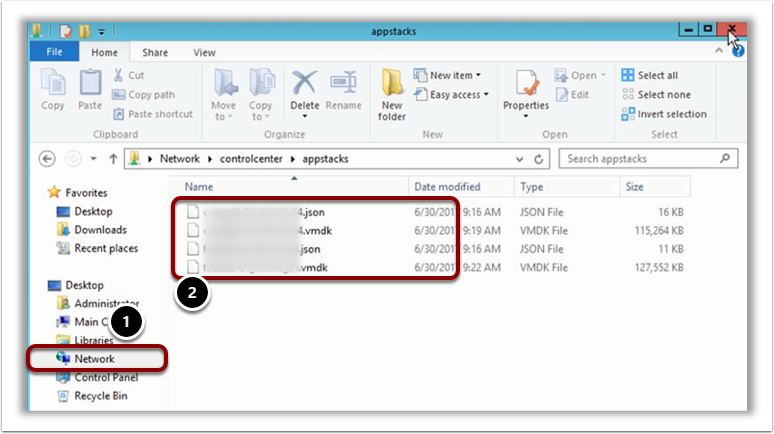 Assign a native application to a virtual desktop: Assign an AppStacks application to a user or group. You import AppStacks applications to Horizon Cloud virtual desktops to make them available. 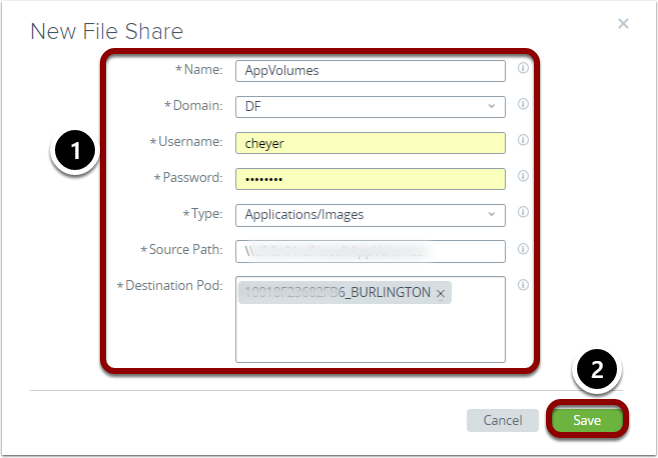 Navigate to the file share that you set up for synchronizing AppStacks packages. Verify that the file share contains at least one package. The file share in this example contains two packages. In the Infrastructure window, click New. Name: Enter a name for the file share. Domain: Select the domain from the drop-down menu. Username: The User account requires read-only permission to the file share. Type: Select Applications/Images from the drop-down menu. Source Path: Enter the source path URL. Destination Pod: Click the field and select the destination pod, required only for the Applications/Images type. Wait until the green banner appears at the top to verify success. Confirm that the file share is now listed with a green active status. In the upper right, click the Notifications bell icon to see the status of the import. In the navigation bar, select Monitor. In the Monitor menu, select Notifications. In the Notifications window, Show field, select a time frame to see the status of the imported file share using an alternative route. In the navigation bar, select Inventory. In the Inventory menu, select Applications to verify that the process of importing the AppStacks is complete. 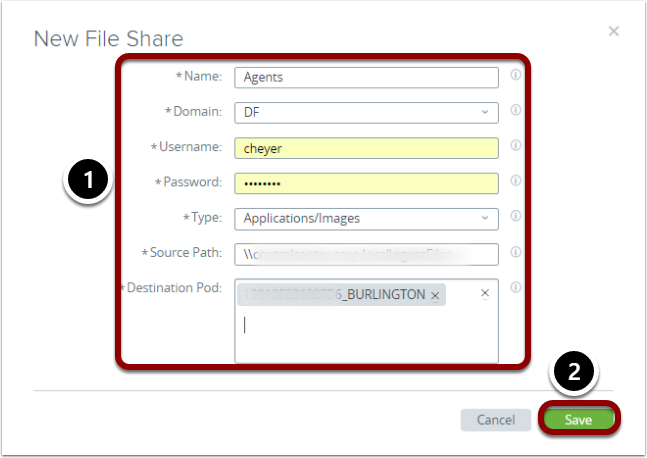 After you finish importing the AppStacks file share, proceed to the next exercise to assign an application to a user. To deliver an AppStacks application to Horizon Cloud virtual desktops, you assign it to a user or user group. On the New Assignment page under Applications, click Select. Type: Select Native, which enumerates all AppStacks applications. Assignment Name: Enter the name of the application. For this example, FileZilla is entered. OS: Accept the default Windows 10 (x64). Computer Name Prefix: Leave this field blank. In the New Application window, select the box to the left of the application. In the Users/User Group field, start entering the name of the user to assign. In the list pops up, click the user to select it. In the Selected Users/User Groups field, verify that the user name is displayed. In the lower right, click Save & Exit. When the application is assigned, you can close the browser window. After assigning the native application, proceed to the next exercise to assign and provision a desktop. To verify that the application assignment was successful, you can launch the native application in Horizon Cloud. But first, you must provision a desktop to be used for launching native AppStacks applications. 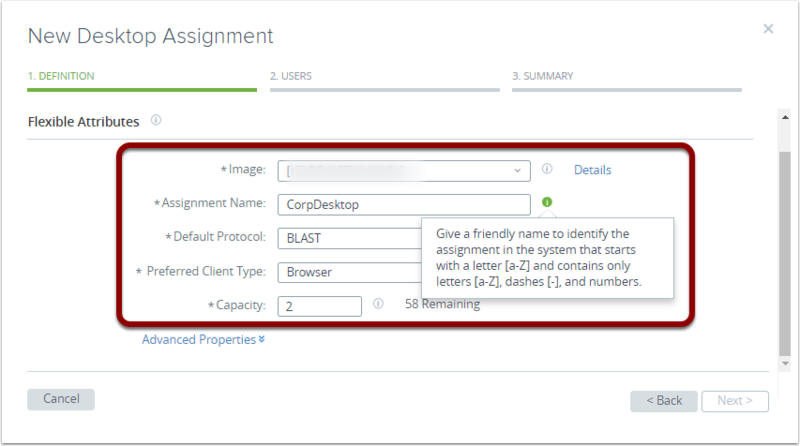 In the Horizon Cloud Administrative Console, select Assign. In the Assignments menu, click New. In the Definition tab of the New Desktop Assignment window, click the Floating type. This type is required for instant clones. In the Fixed Attributes field, select a desktop model from the pop-up menu. Scroll down to Flexible Attributes. Image: Confirm the default image, or select a different one from the drop-down menu. Assignment Name: Enter the name of the assignment, which in this example is CorpDesktop. Default Protocol: Confirm that BLAST is selected. Preferred Client Type: Confirm that Browser is selected. Confirm that the VM Names field is pre-populated with the name of your selected application. In the Users tab of the New Desktops Assignment window, in the Active Directory Search field, start entering the first few letters of the user or group name. From the list that generates, select the user or group to assign. In the Selected User/User Groups field, verify that the name you selected is displayed. In the Summary tab of the New Desktop Assignment window, confirm the information. In the lower right, click Submit. Wait for the assignment to complete. The process can take several minutes. Do not proceed until the creation process is complete. You might need to refresh your browser periodically to expedite the process. When the desktop capacity is displayed, you can continue. 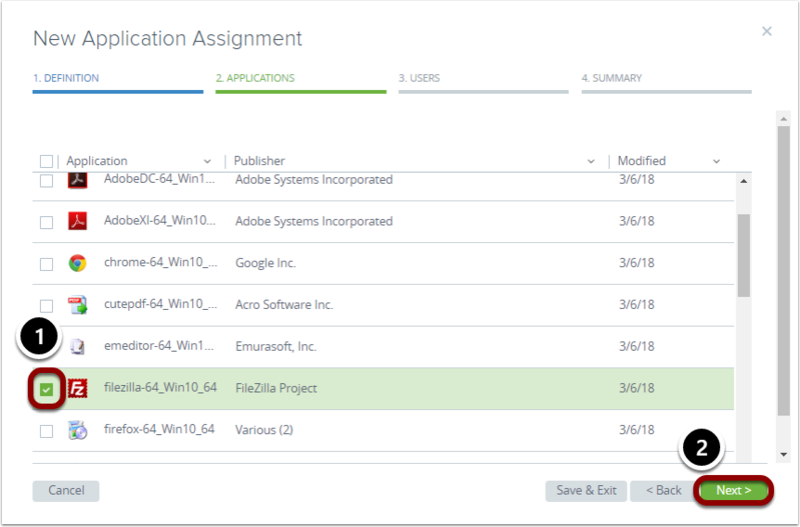 In the Assignments window, confirm that a green success banner is displayed. In the details, confirm that the desktop is displayed with a capacity of 2. Now you are ready to proceed to the next exercise, to verify the application assignment that you made earlier by launching the desktop and accessing the application as the end user would. 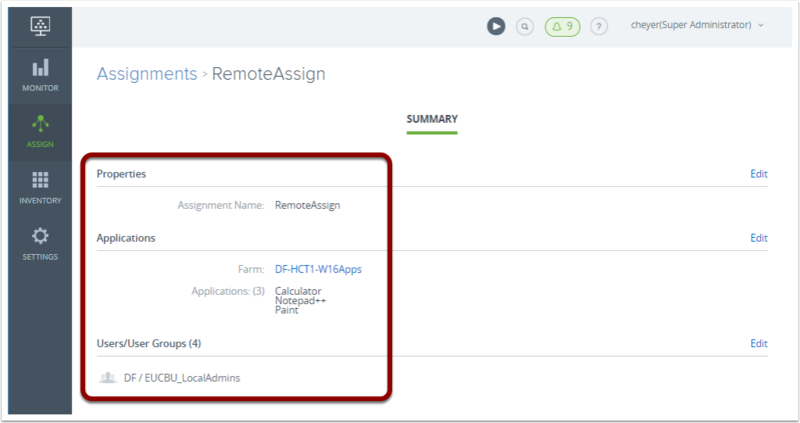 You can verify that you properly assigned an AppStacks (native) application and provisioned a desktop by launching the desktop and accessing the application in Horizon Cloud as a user would. 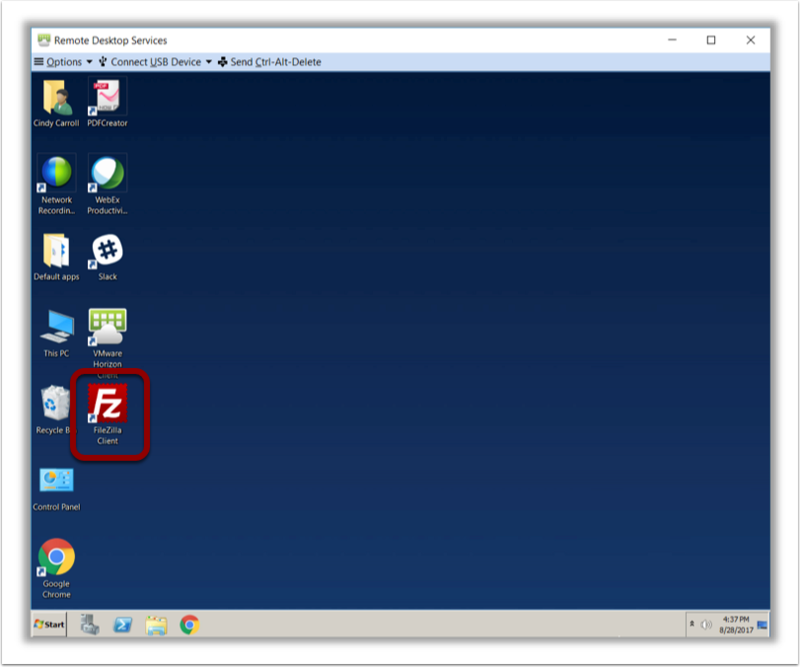 On the desktop, click the VMware Horizon Client icon to launch it. 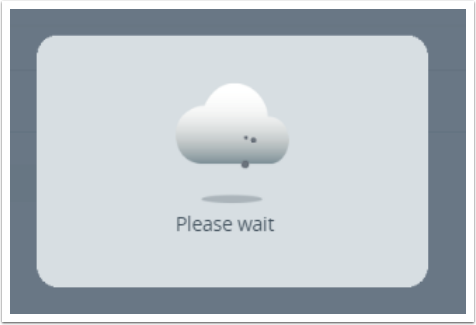 Log in to the Horizon Cloud client. From the available applications and desktops, click the desktop you just provisioned, and wait for the desktop connection to launch and Horizon Cloud to attach the application to the desktop. Verify that the application icon is displayed. Launch the application to verify that it opens. Explore the application features to verify that it works properly. When you are ready to exit, navigate to the upper left and select Options. Click Disconnect and Log Off. In the Horizon Client prompt, click OK to confirm that you want to disconnect and log off. After launching the desktop and accessing the application, proceed to the next exercise to use Horizon Cloud to deliver remote applications. 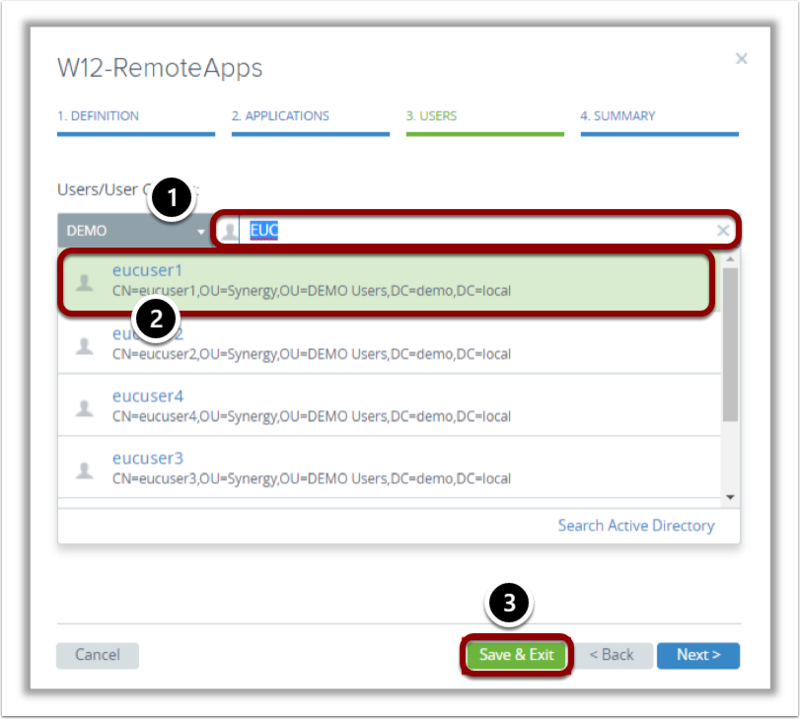 The following exercises demonstrate how to deliver applications using RDS integration capabilities. A Chrome browser is recommended for the best experience. Horizon Cloud Published Applications simplifies managing line-of-business applications and allows the delivery of Windows applications to non-Windows devices. This strategy can reduce CapEx and OpEx costs by minimizing installation, upgrades, and troubleshooting. 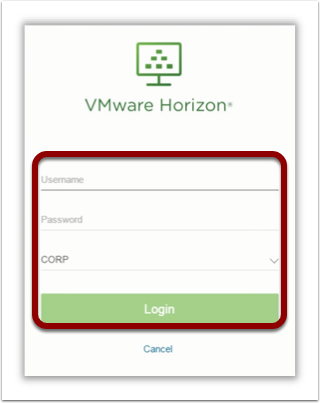 With a VMware implementation, end users launch VMware Horizon Client or the HTML Access web client and then log in to the server that brokers connections to the published applications. Users see a catalog of published applications and session-based or single-user virtual desktops, if desktops have been configured. With published applications, you install applications on servers with the RDSH role and entitle the applications to users through the Horizon Cloud Administration Console. After applications are authenticated to Horizon Cloud, users can launch an application, save files, and use network resources from a remote RDSH server, just as if the users had the application installed on their local computer, tablet, or phone. Select the check box of the pre-populated VM in the optimized image provided in the tenant. 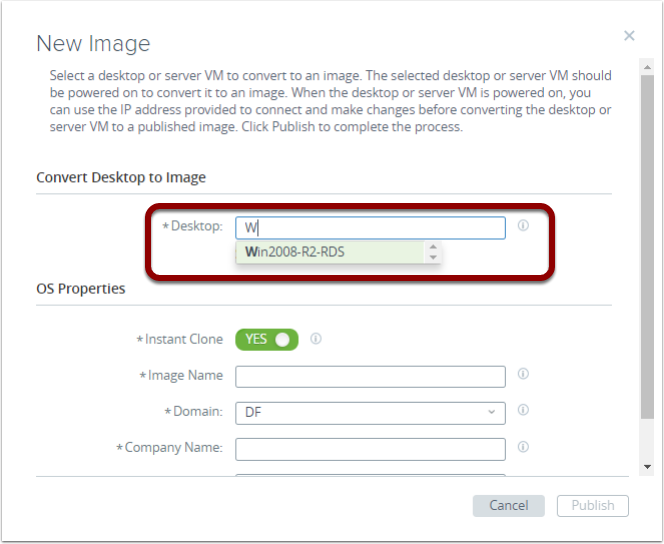 If you do not have an image, contact your VMware representative to request one. In the Imported VMs window, click More. In the More menu, select Power On. Still in the More menu, select Convert to Image. On the New Image page, make sure that OS Properties is set to NO. In the OS Properties fields, provide the information for the other OS properties. In the Admin credentials for the desktop fields, provide the username and password. In the lower right, click Publish. In the Inventory menu, click Images. In the Status column, verify that the image is published. If necessary, click Refresh in the upper right to update the window and see the most current conversion status. For more information, see the Uploading and Deploying RDSH Hosts in Horizon Cloud video. 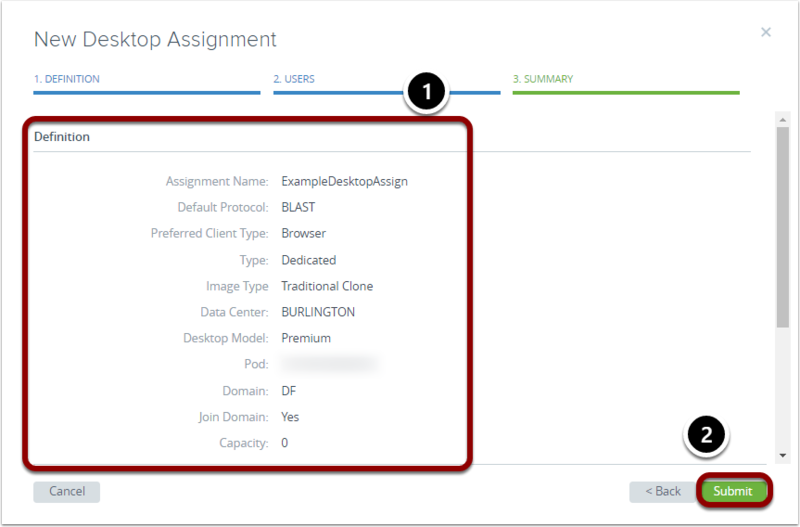 After you finish uploading and deploying RDSH hosts in Horizon Cloud, proceed to the next exercise to create a desktop assignment. 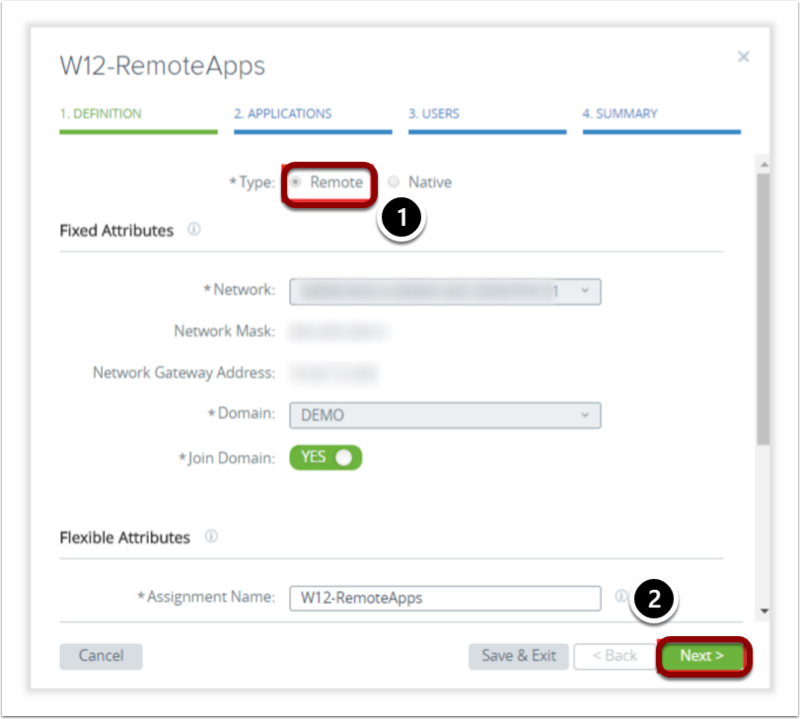 This exercise describes how to create a remote application assignment. 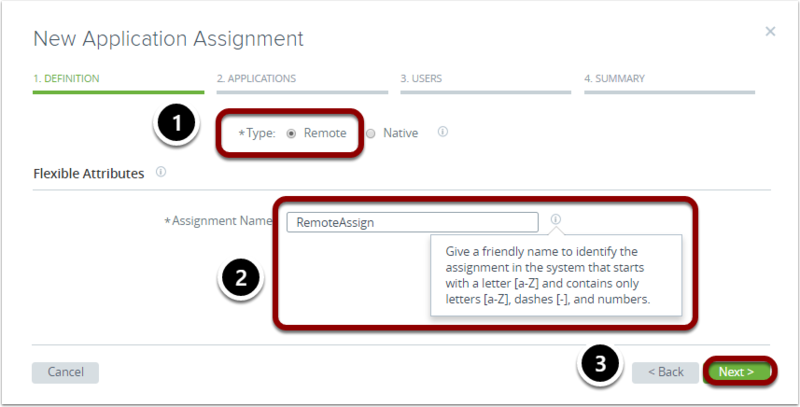 In the New Application Assignment window, in the Type field, select Remote. In the Assignment name field, enter a name that starts with a letter, and consists only of letters, numbers, and dashes. In the New Application Assignment window, click the check box of each application to select it. In the Active Directory Search field, start entering the first few letters of the user or group name. When the search automatically generates, click the user or group to select it. In the Summary tab, review and verify that the information is correct. Verify that the green success banner is displayed. Confirm that the status is green, which indicates the server is ready to receive users. When the status turns green, select the assignment to view details. View the assignment summary details. For more information about how to deploy RDSH servers and create assignments for Horizon Cloud remote applications, see the Uploading and Deploying RDSH Hosts in Horizon Cloud video. After creating a desktop assignment, proceed to the next exercise to assign remote applications to users and groups. You can entitle RDSH applications to a user or group from the Horizon Cloud Administration Console. 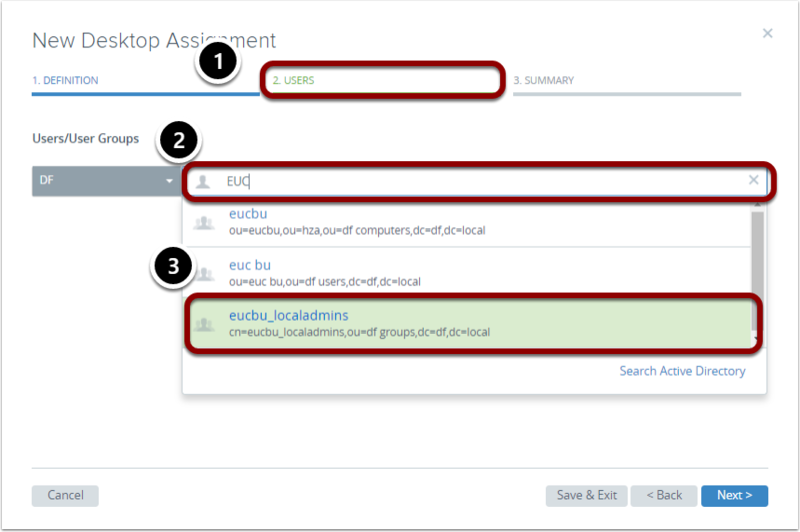 In the Horizon Cloud Administration Console, click Assign. On the Assignments page, select an assignment to add a user to. In the upper left, click Edit. On the Definition tab, in the Type field, select Remote. On the Applications tab, scroll down the list to see the applications assigned to this entitlement. You can add or remove applications to the assignment here, but for this exercise, leave them selected. On the Users tab, enter the username to search for the user to assign. 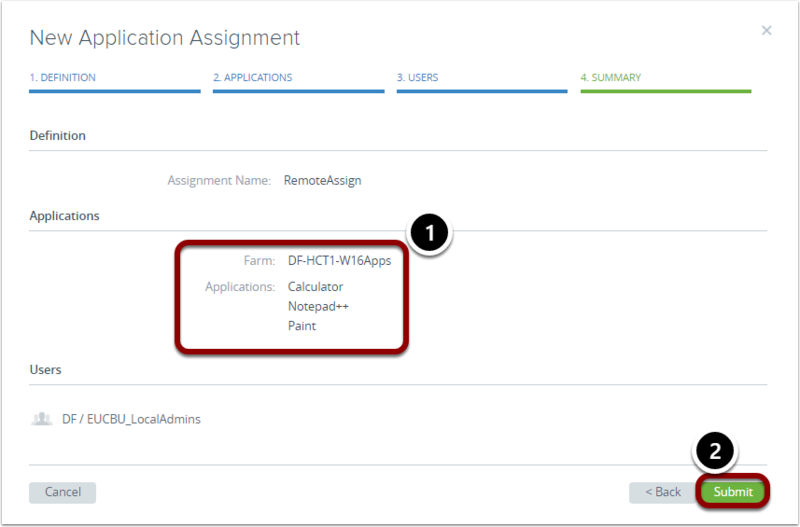 After you finish entitling the user to the RDSH Application entitlement, proceed to the next exercise to launch the remote application hosted in Horizon Cloud. You can verify that you properly entitled a user to an RDSH application by launching the desktop and accessing the application in Horizon Cloud as a user would. 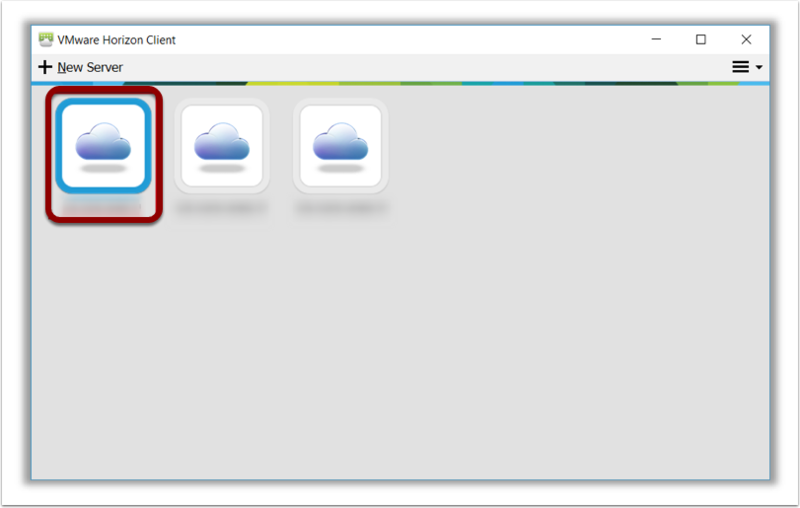 On the desktop, click the VMware Horizon Client icon. From the available applications and desktops, click the desktop you just provisioned. Launch the application to verify that it opens properly. Explore the features to verify that they work. 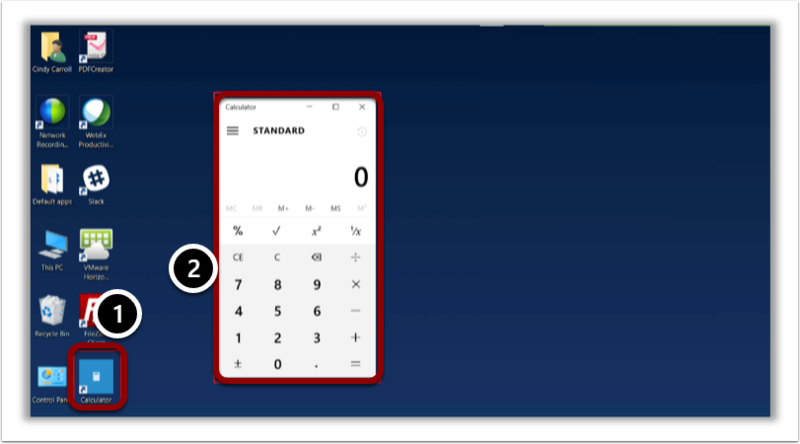 For this example, Calculator is selected. After closing the application, select Options to exit. In the Horizon Client prompt, click OK to confirm the disconnect and log off. After you launch the remote application to verify that the assignments work properly, you have finished this section. 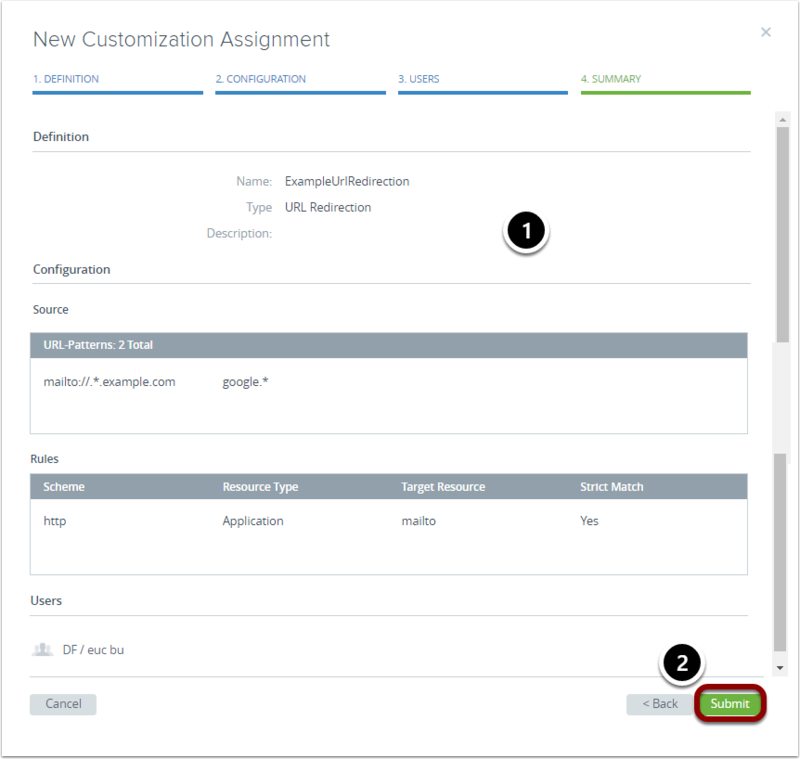 Proceed to the next section to find out how additional VMware products can enhance a user’s experience in the Horizon Cloud environment, in particular, VMware Identity Manager™. You can configure assign settings to customize your end users' environments. One type of customization is URL redirection. 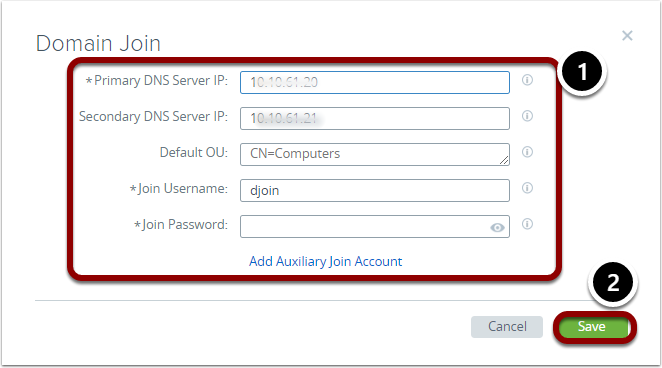 You define URL handling rules so the Horizon Client redirects URLs from the end user's client machine to a desktop or application that is provided by your Horizon Cloud environment. If the handler specifies that a desktop be used, the desktop's default application for the link's specified protocol processes the URL. If the handler specifies that an application be used, the assigned application processes the URL. If the user is not entitled to the desktop or application specified in the handler, Horizon Client displays a message to the user (unless you set Strict Match to No. The system searches the user's assignments using a substring match of the target resource specified for the handler. If the system finds an assignment that matches the substring, that assigned desktop or application is used to open the link. 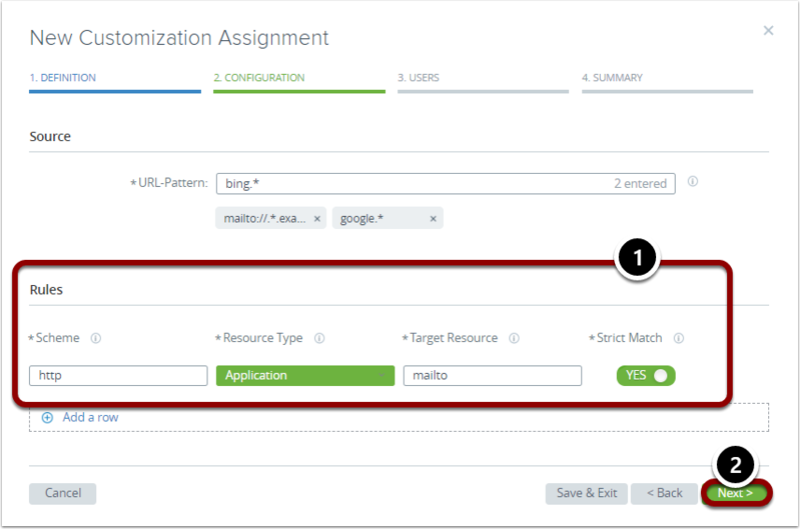 When the Resource Type is set toApplication, if the search for a substring match fails, the system searches the user's application assignments for an assigned application that can handle the protocol specified in the Scheme field. Note: This applies only if the Resource Type is set to Applications. If the Resource Type is set to Desktops, this step is skipped. If the system cannot locate a resource that can handle the protocol, Horizon Client displays a message to the user. Note: The Customization window is provided for you to configure client-to-agent URL redirection. For configuring agent-to-client URL redirection, you use a different procedure. For more information about agent-to-client URL redirection, see Configuring Agent-to-Client Redirection. 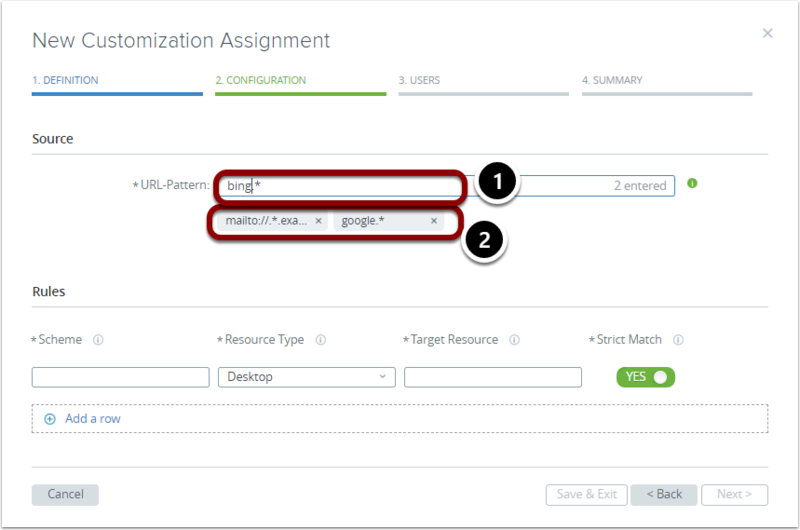 You can customize your end users' environments by making URL redirection assignments. You do this by configuring the client-to-agent URL redirection rules that tell the Horizon Client to redirect URLs from the end user's client machine to a desktop or application within your Horizon Cloud environment. The user's Horizon Client must be installed with the URL_FILTERING_ENABLED=1 option so the client can handle URL redirection. For more information, see the Installing Horizon Client for Windows with the URL Content Redirection Feature topic in the VMware Horizon 7 documentation. The Horizon agent in the base image used by the farm was installed using the URL_FILTERING_ENABLED=1 parameter on the command line. Your Horizon Cloud inventory has the desktops and remote applications that you intend to use in the configuration. If the customization has Strict Match set to Yes, assignments must exist that entitle the specific desktops and remote applications to the end users specified in the customization. In the navigation bar, select Assign. In the Assignments window, select New. In the New Assignment window, click Select. In the Definition tab of the New Customization Assignment window, enter an Assignment Name. 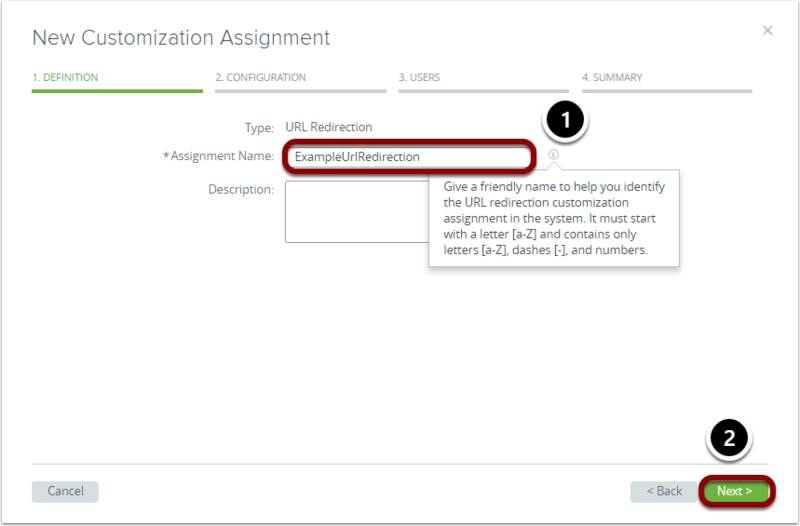 Note: Provide a unique name to help you distinguish this URL redirection customization assignment from others in the system. It must start with a letter, and contains only letters, dashes, and numbers. In the Configuration tab of the New Customization Assignment window, define the URL patterns to be intercepted. To specify that all URLs be redirected for all schemes, enter the star symbol (*). Examples include: https://www.vmware. *, www.vmware.com, *vmware.com, and so on. On your keyboard, press Enter after each entry to save it and add multiple URL patterns. Enter as many additional URL patterns as you want. Scheme: Enter the URL scheme type for the URL pattern you entered earlier. This specifies which schemes to consider when matching any scheme-less URL patterns defined earlier. For example, if there is any content for the URL patterns specified that uses or matches the http protocol, it is redirected. Desktop: The system searches the user's assignments, and if it finds a match, the desktop is used to open the link. Application: The system searches the user's assignments, and if it finds a match, the application is used to open the link. If the search fails, the system searches for an application that can handle the protocol in the scheme. Target Resource: Enter a target source for the type you selected. For example, an application or assignment name, or http or mailto, and so on. Yes: Select Yes to search the Resource Type for the exact match to the Target Resource. For example, if Chrome is entered but the user is not entitled to use it, a message is displayed to the user. No: Select No to search the Resource Type for the next best match to the Target Resource. For example, if Chrome is entered but is not installed on the desktop, a default browser is used. 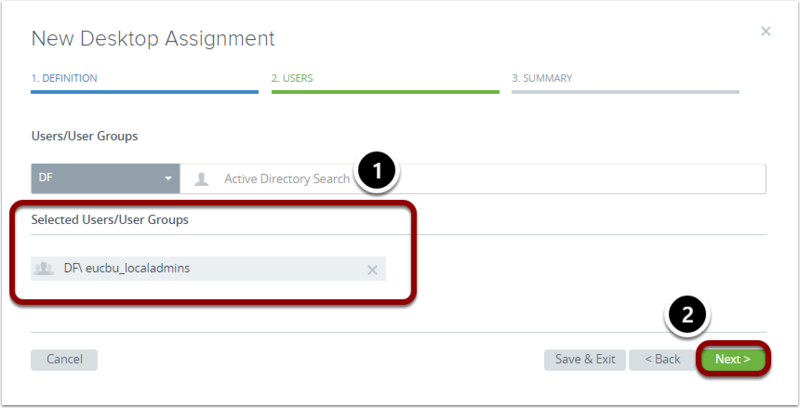 In the Users tab of the New Customization Assignment window, click the Active Directory Search field to begin. In the search hit list, select as many users or groups as you want to include. On your keyboard, press Enter to save your selections. When you have selected all the users or groups that you want to include, click Next. 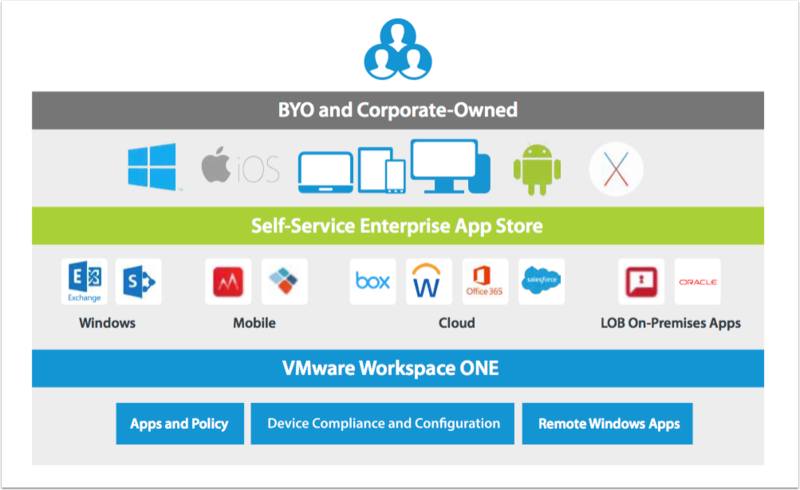 VMware Identity Manager, optimized with VMware AirWatch® Conditional Access, delivers one-touch access to nearly any application from any device. At the same time, VMware Identity Manager provides you a central place to manage access policies and user provisioning with enterprise-class directory integration, identity federation, and user analytics. 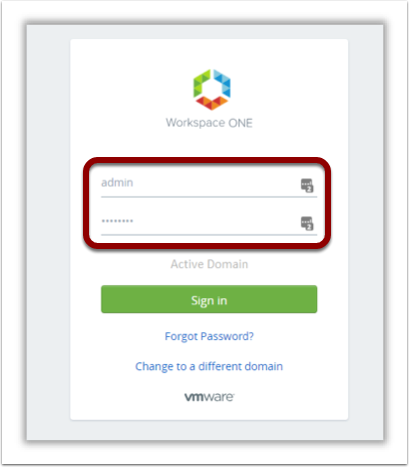 Components of VMware Identity Manager include the VMware Workspace™ ONE™ portal, AirWatch Directory integration, access policy integration, and Horizon Cloud integration. For more information, see VMware Identity Manager. 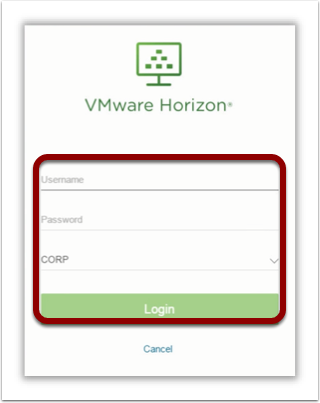 You can enable Horizon Cloud desktops and applications in VMware Identity Manager by configuring the cloud-based version of VMware Identity Manager with Horizon Cloud with Hosted Infrastructure. It is assumed that you already have a VMware Identity Manager deployment set up with users and groups synchronized with your Active Directory. 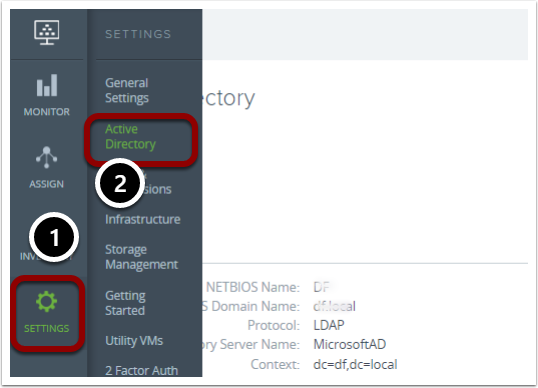 Log in to VMware Identity Manager using your Active Directory domain. In the upper right corner, click the person icon. Select Administration Console from the drop-down menu. 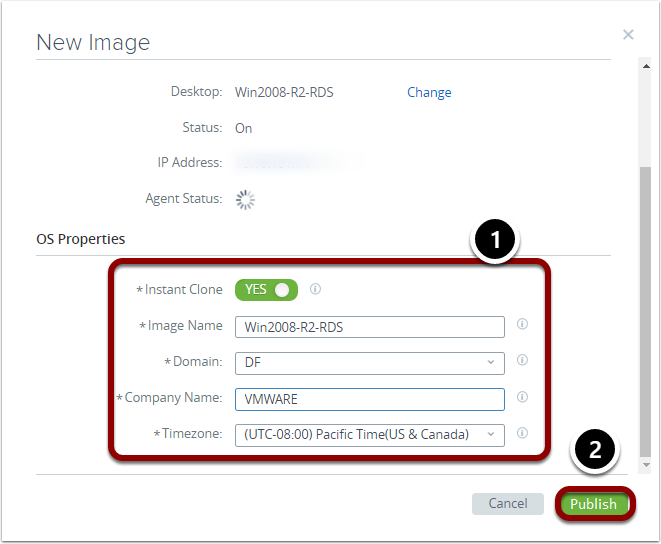 In the VMware Identity Manager Administration Console, select Catalog. In the drop-down menu, click Virtual Apps. In the Virtual Apps window, select Virtual App Configuration in the upper row. In the Virtual App Configuration window, click Add Virtual Apps. In the drop-down menu, click Horizon Cloud. Name: Enter a friendly name for the virtual applications. Sync Connectors: Select from the drop-down menu, or Add Connector. In the Tenants pane, click Add Tenant. Scroll down the Horizon Cloud window to the Tenants pane. Tenant Host: Enter the fully qualified domain name (FQDN) of the Horizon Cloud Tenant URL. Tenant Port: Accept the default port of 443. Admin User: Enter the username of the tenant host. Admin Password: Enter the password for the tenant administrator account. Admin Domain: Enter the Active Directory NETBIOS domain name where the tenant administrator resides. 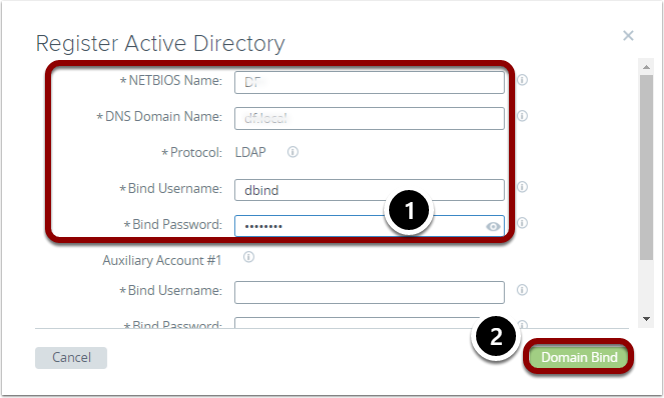 Domains to Sync: Enter the Active Directory NETBIOS domain names for synchronizing Horizon Cloud resources and entitlements. Assertion Consumer Service URL: Enter the IP address or hostname of the Horizon Cloud tenant, such as https://example.url.com. True SSO enabled on Horizon Cloud: Check the check box if True SSO is enabled for this Horizon Cloud tenant. When the parameters are saved and the operation is completed, proceed to the next exercise to configure the Federation Artifact. 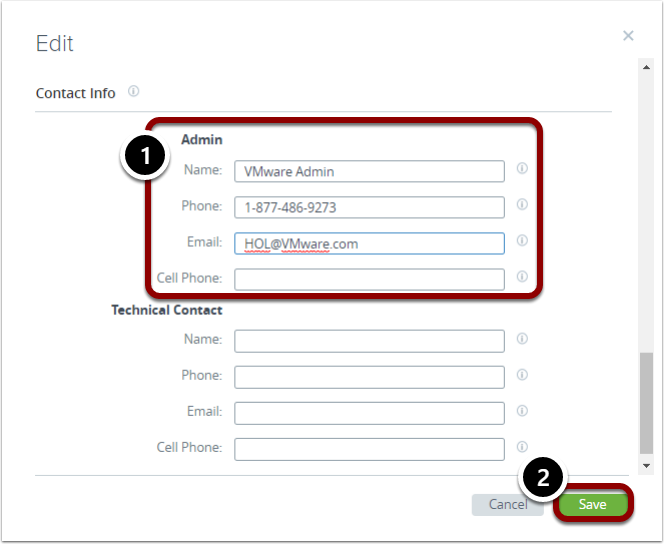 Your Horizon Cloud infrastructure must be configured to communicate with VMware Identity Manager. In the Settings menu, click Identity Management. In the Identity Manager window, click New. Timeout SSO Token: Accept the default. Data Center: Select the data center from the drop-down menu. Click Save, and verify that a message appears saying the settings have been saved successfully. 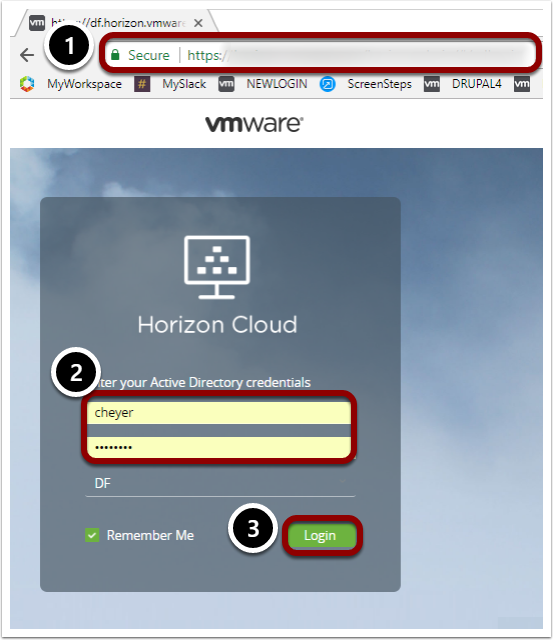 After you finish configuring Horizon Cloud to communicate with VMware Identity Manager, proceed to the next exercise to entitle a user to applications and desktops, synchronize VMware Identity Manager manually, and launch a connection to an application or desktop through VMware Identity Manager. 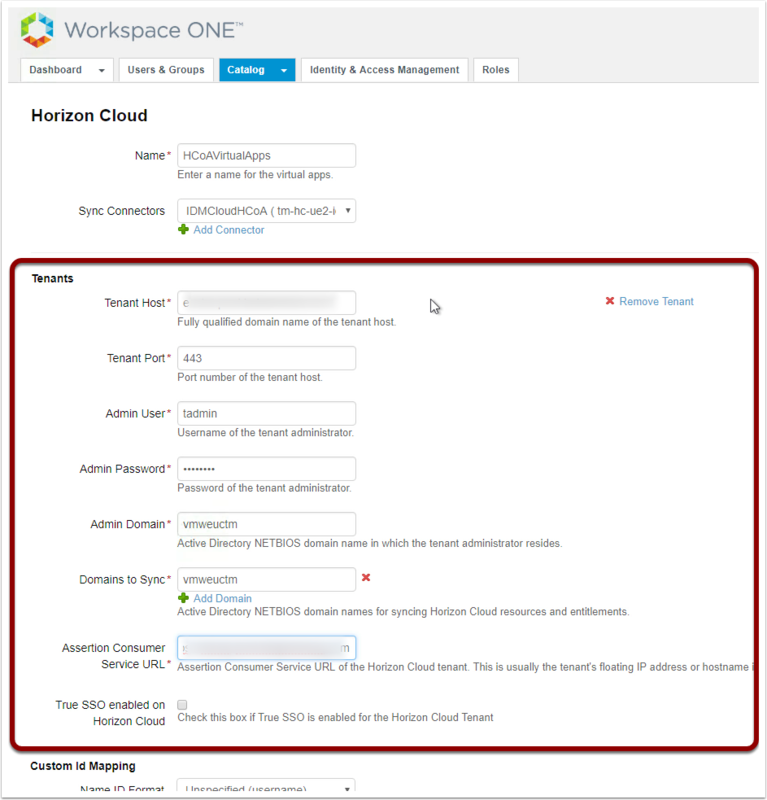 In this exercise, you gather information in the Workspace ONE administration console, that you then provide to Horizon Cloud in the Horizon Cloud Administration Console, to establish the connection. 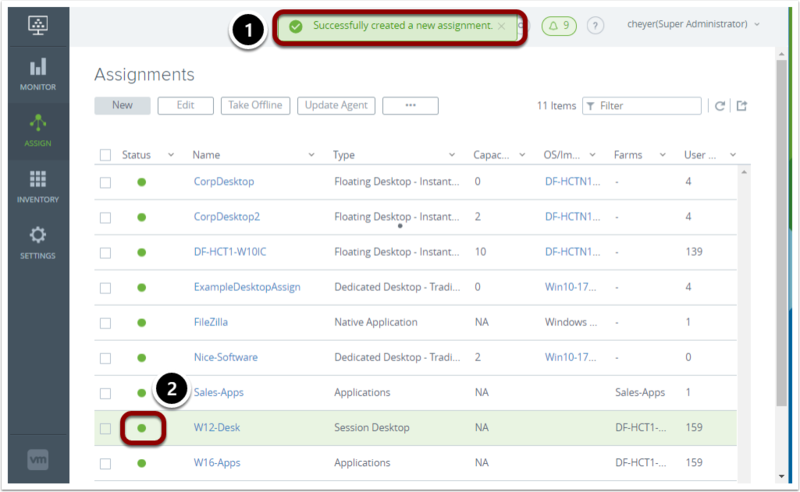 In the Workspace ONE console, select the Catalog tab. In the Catalog menu, select Web Apps. In the upper right of the Web Apps window, click Settings. On the navigation bar to the left under SaaS Apps, click SAML Metadata. In the SAML Metadata pane on the right, click Copy URL. When the green banner appears confirming the data is copied to the clipboard, you can paste it and save to use later. 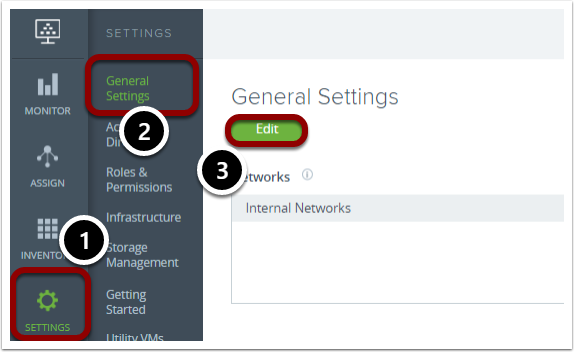 Return to the Horizon Cloud Administration Console, and click Settings. In the Settings menu, select Identity Manager. VMware Identity Manager URL: Paste the VMware Identity Manager SAML IdP metadata URL that you copied earlier. Timeout SSO Token: You can enter an optional period of time in minutes before the session times out. In this example, that time period is 0 minutes. Data Center: Click the down arrow and select a Data Center from the menu for the Identity Manager. Tenant Address: Enter the address of the tenant appliance. In the lower right, click Save. When you complete this exercise, proceed to the next exercise to verify that the integration is working. 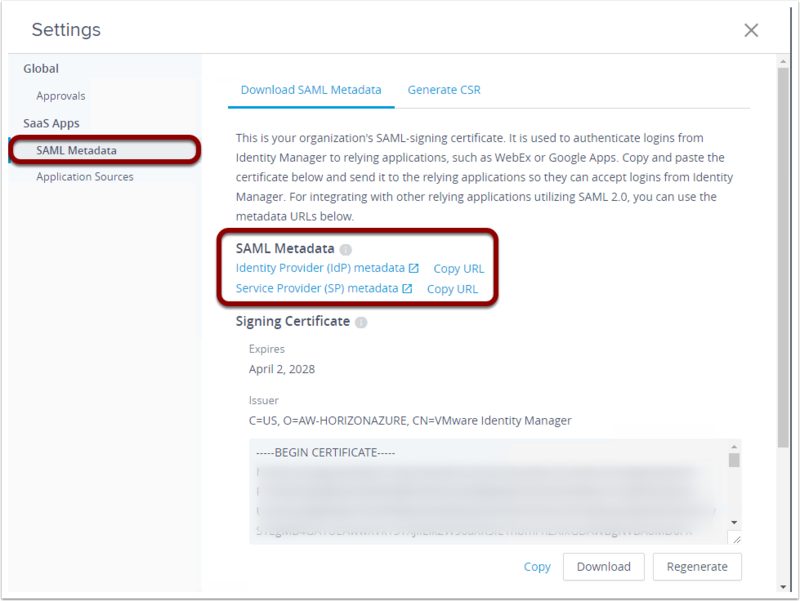 You can verify that you integrated Horizon Cloud with VMware Identity Manager by launching a Horizon Cloud application and accessing it in VMware Identity Manager as a user would. From the VMware Identity Manager User Portal, click Bookmarks. Right-click an application to view details. To launch the application using the Horizon Client, click Launch in Client. To launch the application using the HTML5 Client, click Launch in Browser. Verify that the application launches properly. Explore the features of the application. 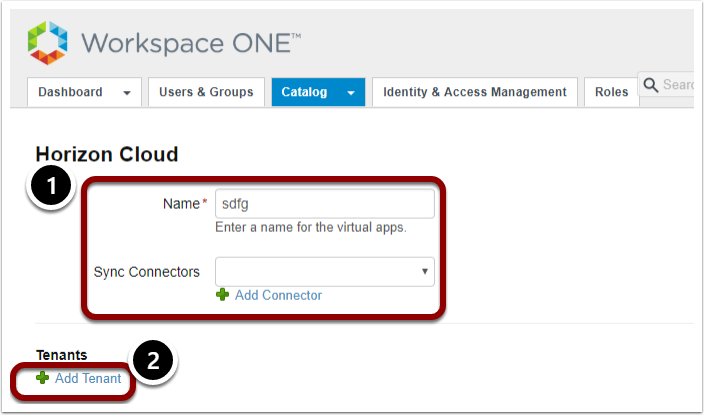 After you launch the Horizon Cloud application from VMware Identity Manager to verify that the integration works properly, you have finished this section of the Quick-Start Tutorial. This also concludes the exercises of the Quick-Start Tutorial. To find out more about additional products that enhance Horizon Cloud, see I: VMware User Environment Manager with Horizon Cloud. 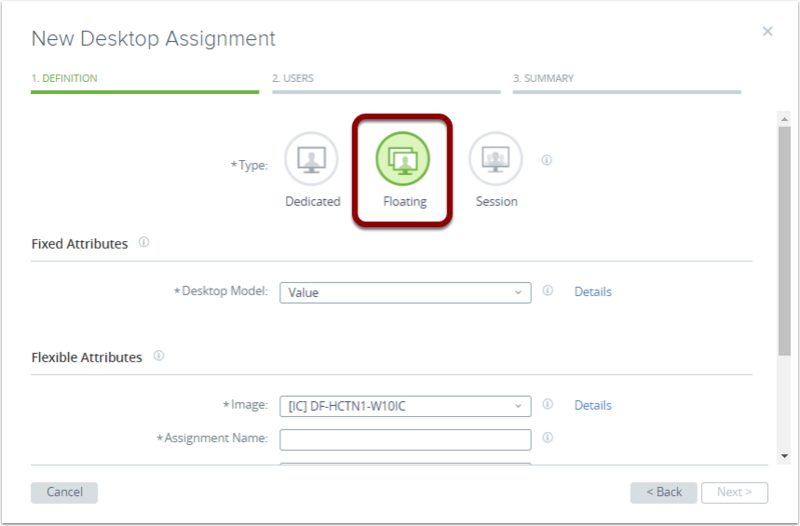 VMware User Environment Manager complements Horizon Cloud by managing application and desktop settings for all users at a granular level. 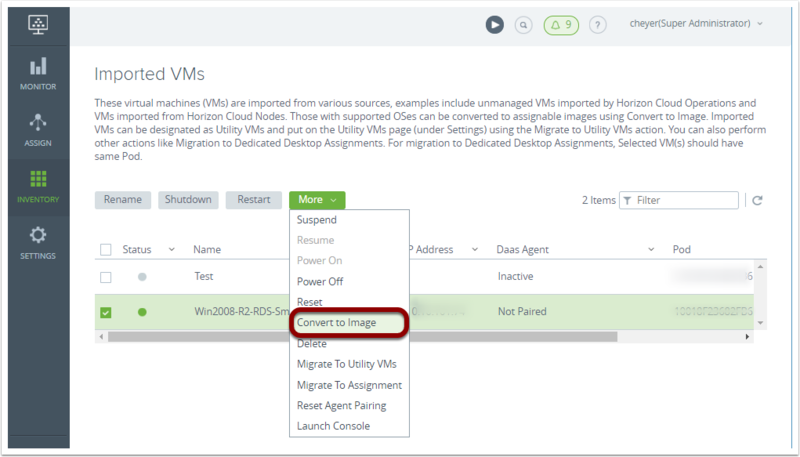 You can explore the benefits of integrating VMware User Environment Manager and Horizon Cloud in this section. VMware User Environment Manager offers personalization and dynamic policy configuration across any virtual, physical, and cloud-based Windows desktop environment. It simplifies end-user profile management by providing organizations with a single, lightweight, and scalable solution that leverages existing infrastructure. It accelerates time-to-desktop and time-to-application by replacing bloated roaming profiles and unmaintainable, complex login scripts. It maps environmental settings, such as networks and printers, and dynamically applies end-user security policies and personalization. Installing and configuring User Environment Manager with Horizon Cloud is similar to using User Environment Manager with traditional virtual desktops and applications. The primary difference is where the data is stored. To maintain an optimal end-user experience, VMware User Environment Manager in Horizon Cloud stores the data on a Windows-based file server housed in your enterprise network in Horizon Cloud. This tutorial provides an overview of the VMware Horizon Cloud family of products, including the system architecture, components, and features. A series of exercises takes you through the processes for setting up a Horizon Cloud infrastructure and initial configuration. You explore the key features of Horizon Cloud through exercises, including creating and publishing a desktop image and assigning access to desktops and remote and native applications. It also addresses how additional VMware products can enhance a user’s experience in the Horizon Cloud environment, such as VMware Identity Manager, App Volumes, and VMware User Environment Management. A VM that has been created and configured for desktop deployment and which will serve as the core image for clones. For full clones, the master image is a VM template. 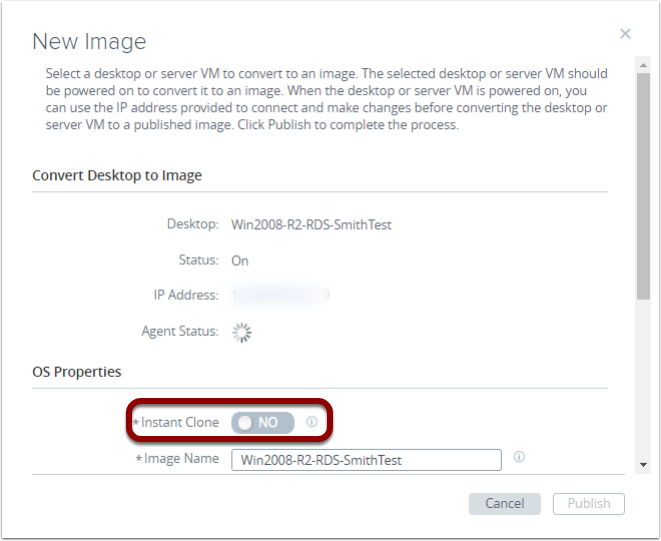 For linked clones, the master image is the parent VM plus a selected VM snapshot. The master image can also be referred to as a desktop image, a golden image, or a linked-clone desktop image. For more information about terms, see the VMware Technical Publications Glossary or VMware Technical Publications Glossary Online.